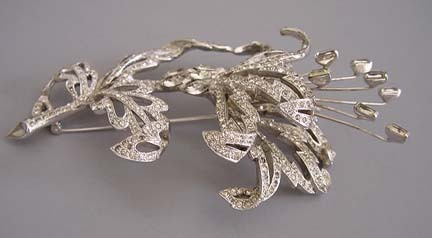 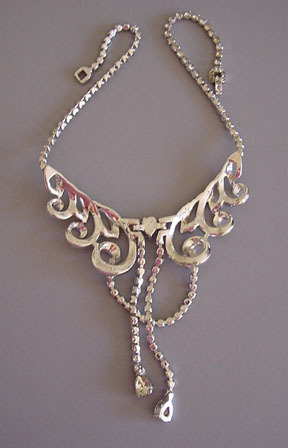 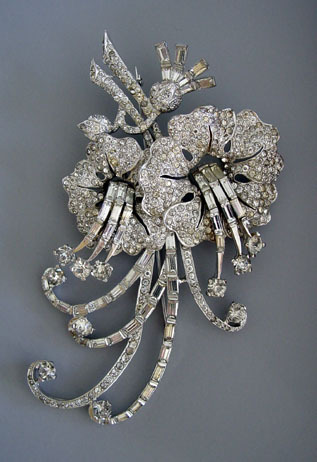 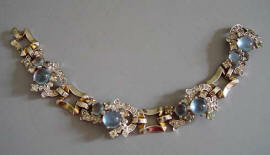 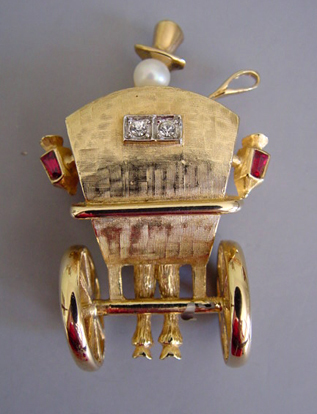 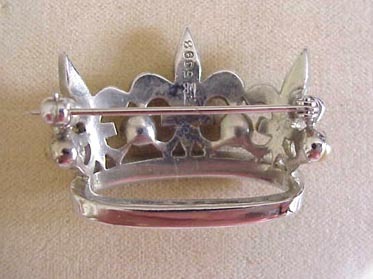 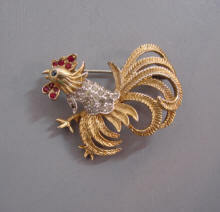 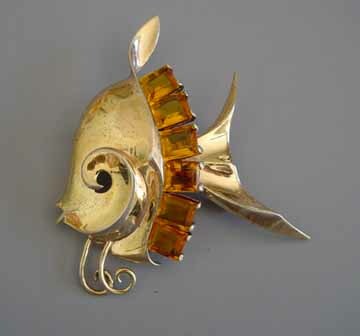 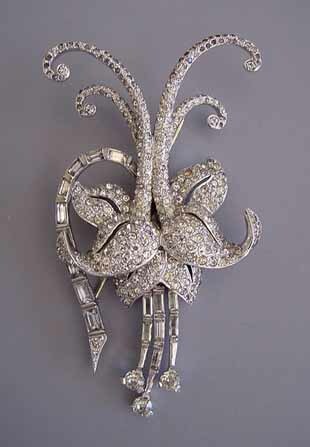 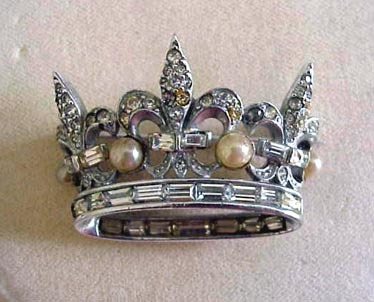 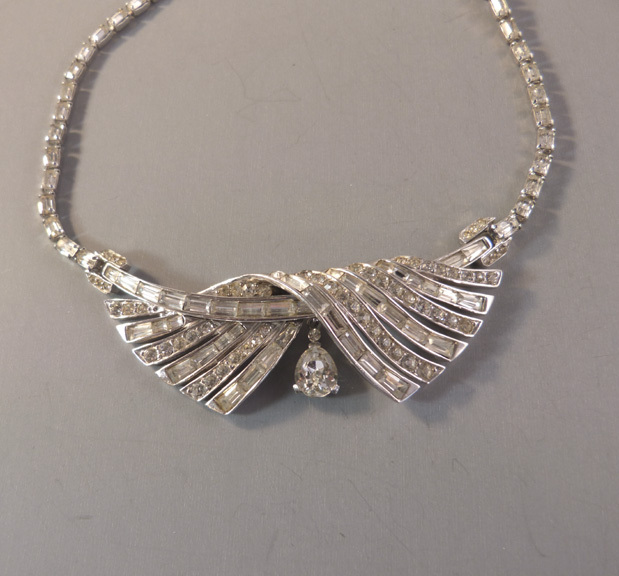 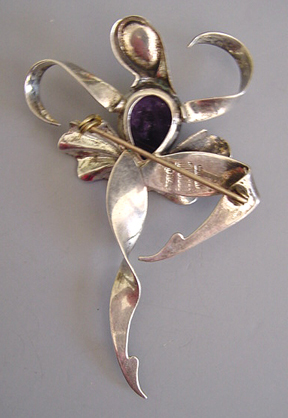 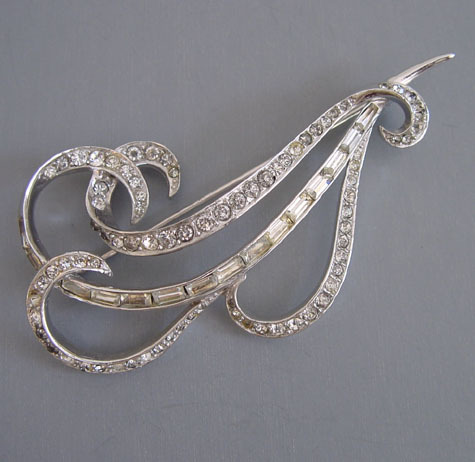 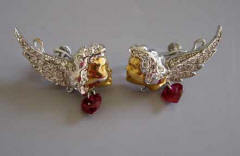 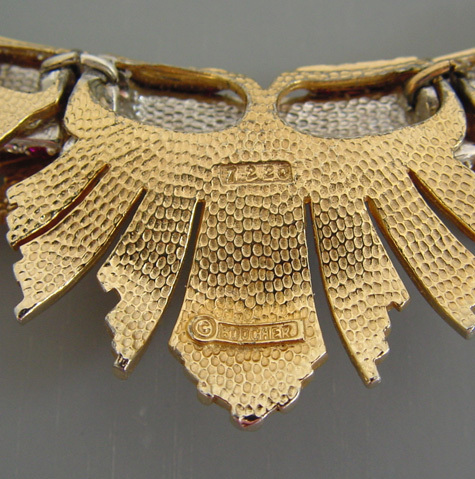 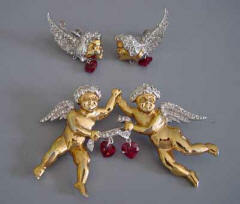 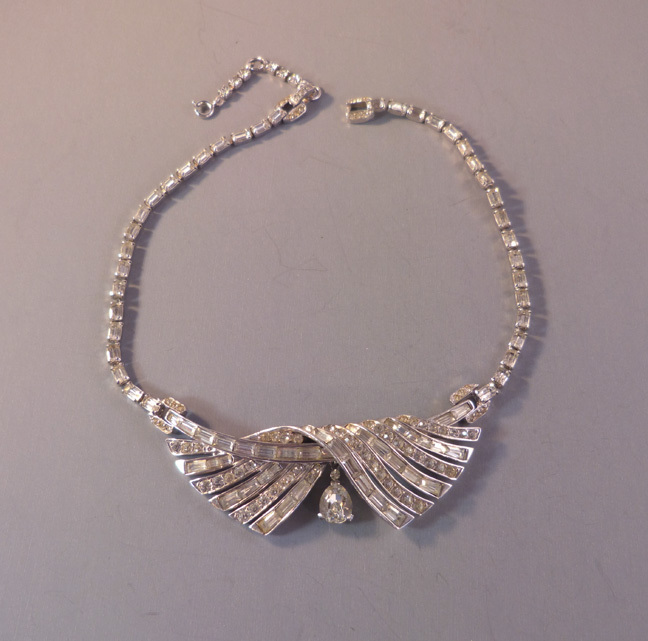 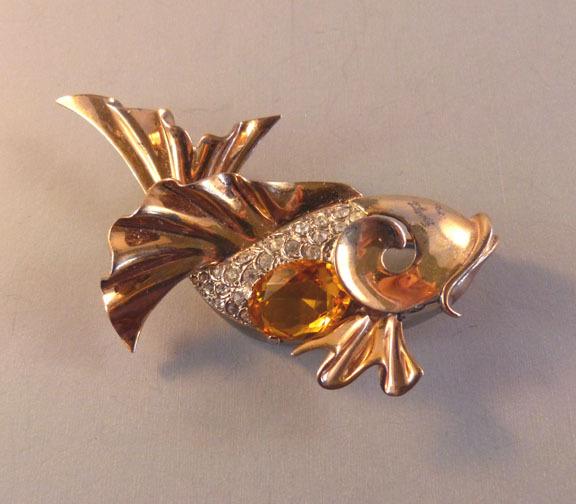 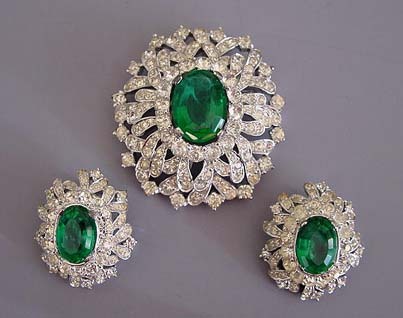 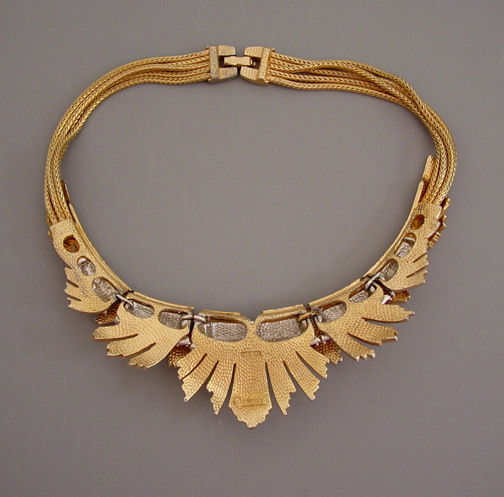 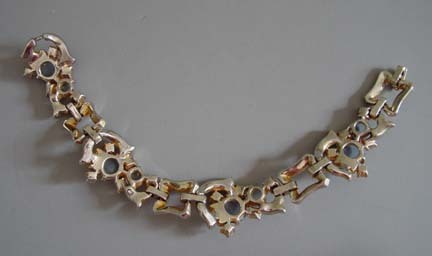 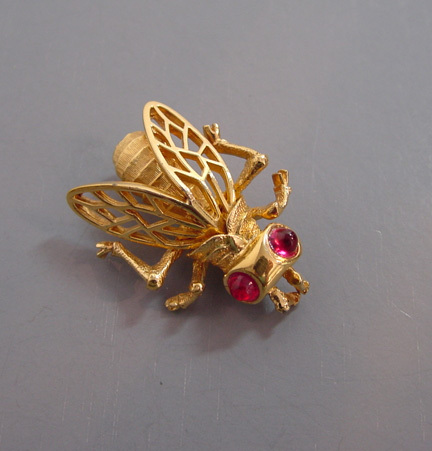 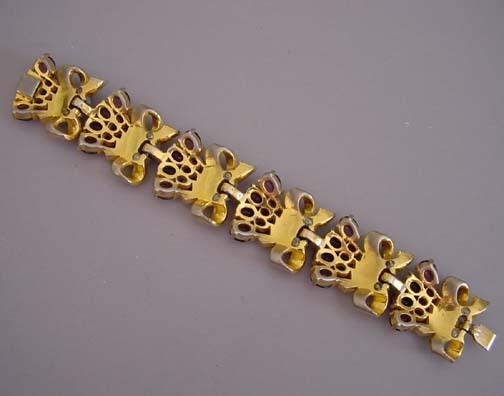 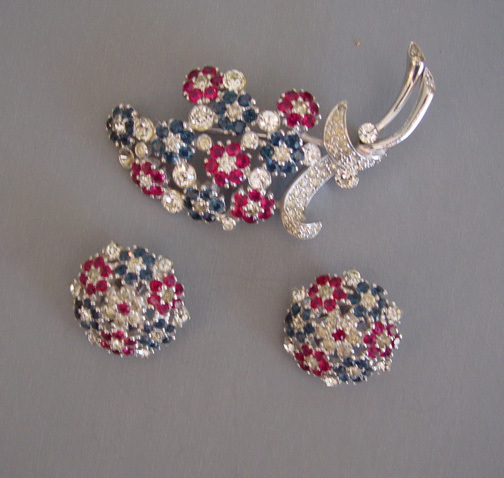 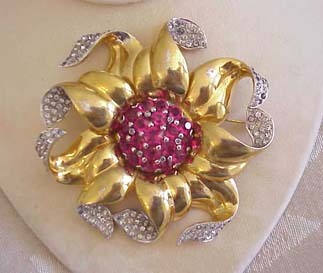 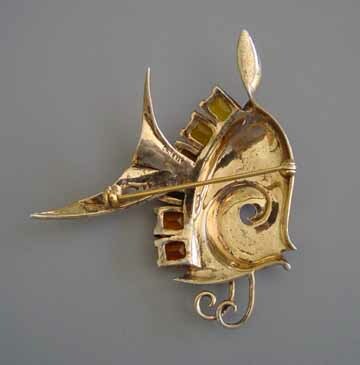 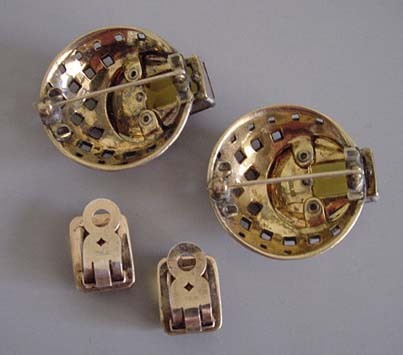 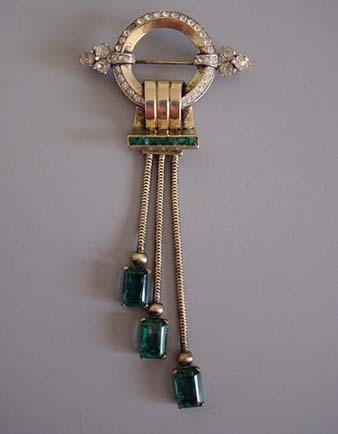 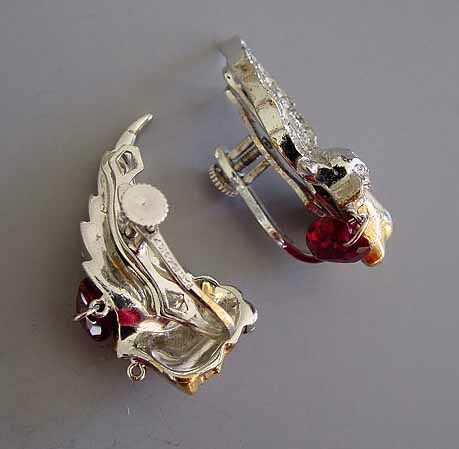 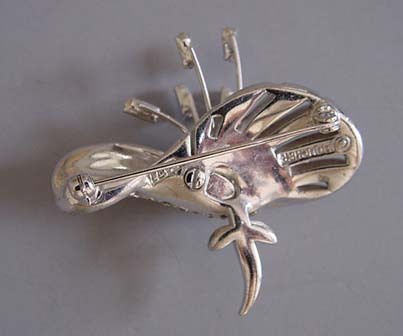 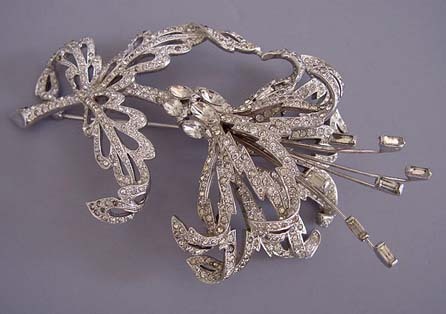 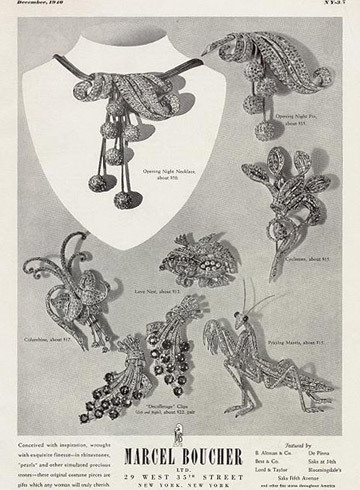 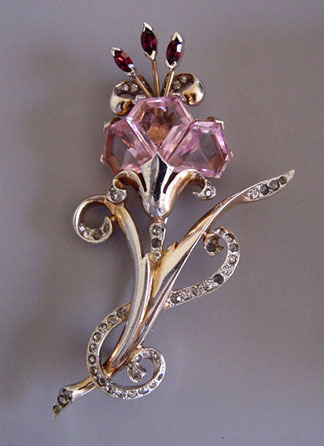 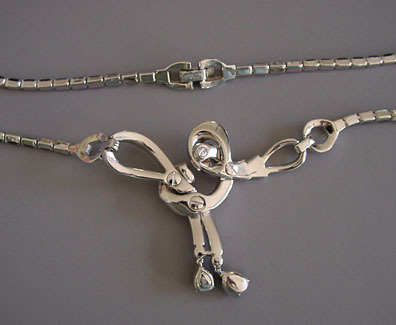 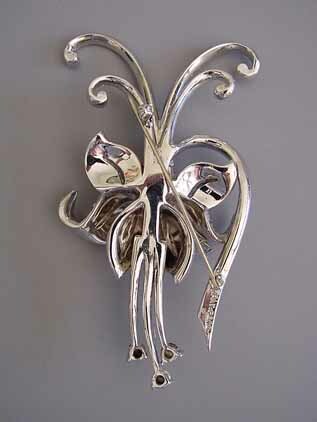 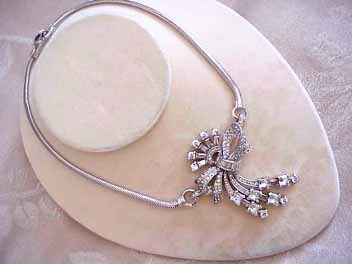 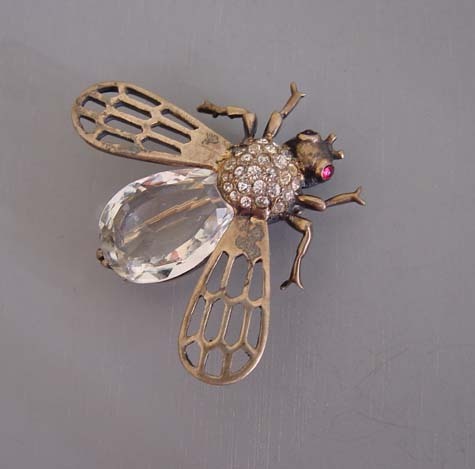 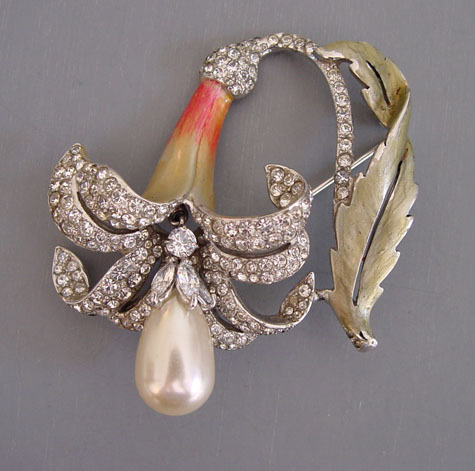 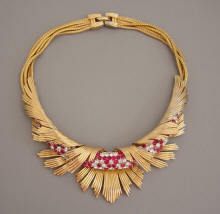 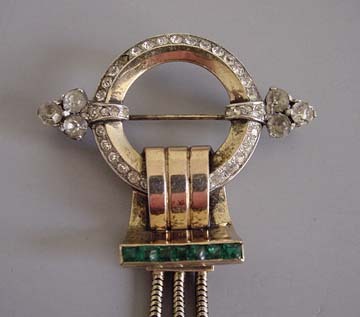 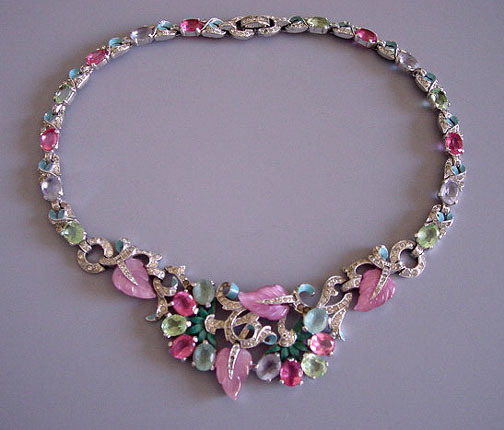 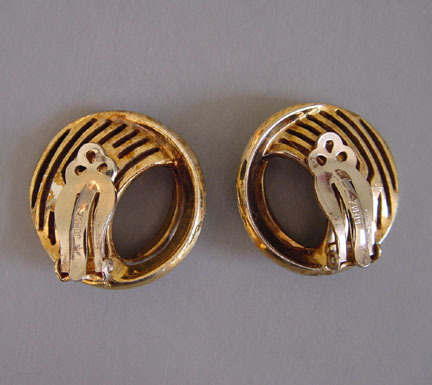 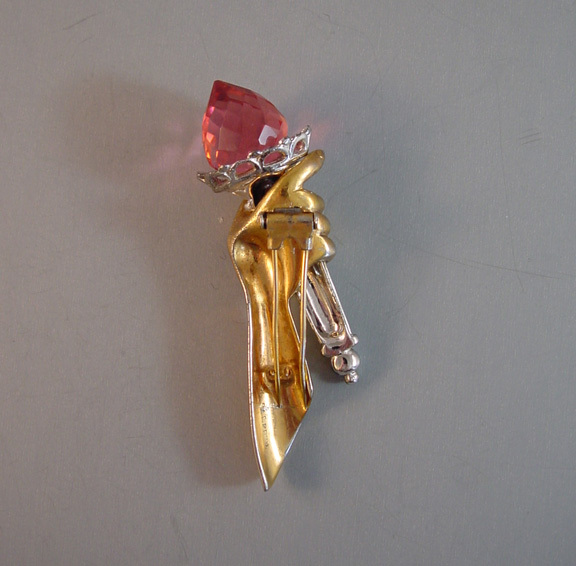 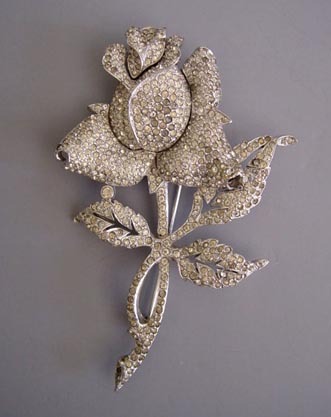 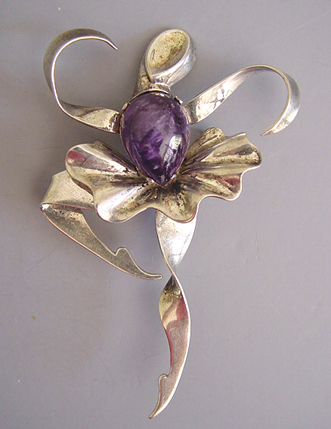 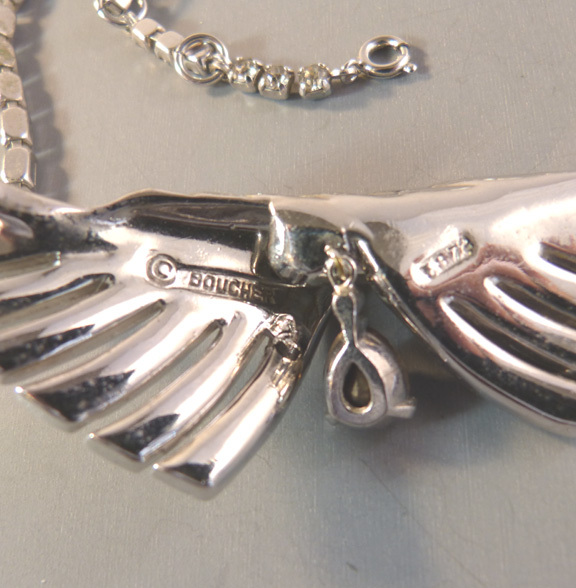 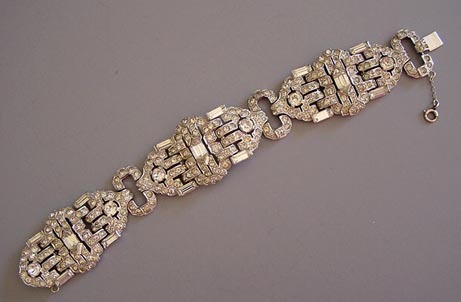 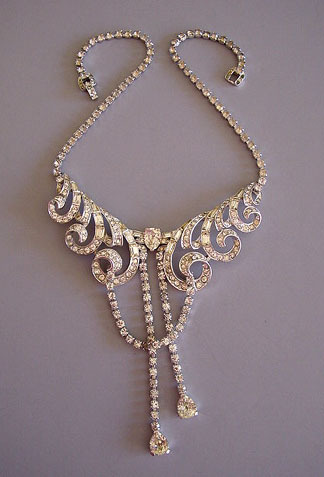 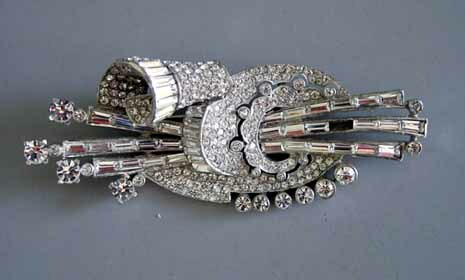 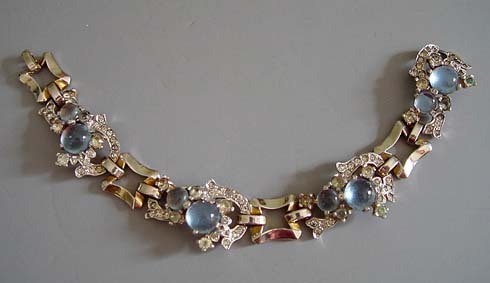 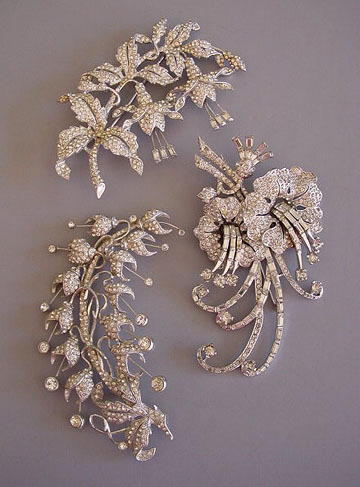 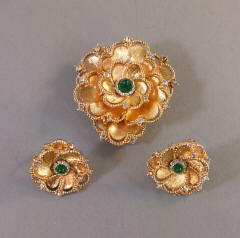 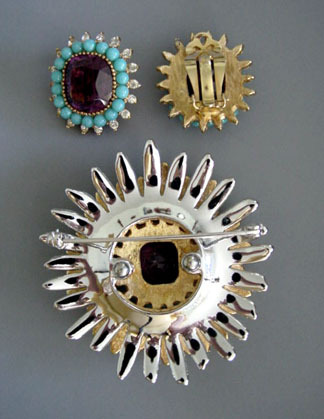 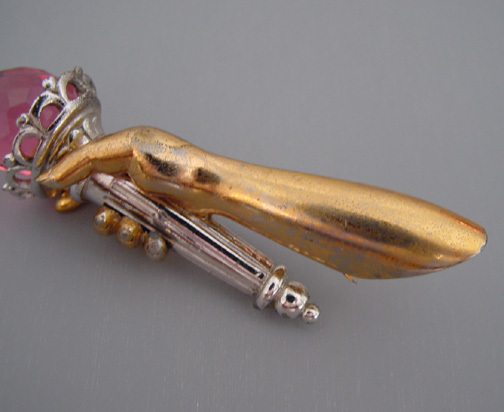 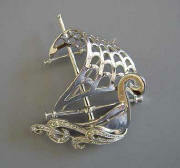 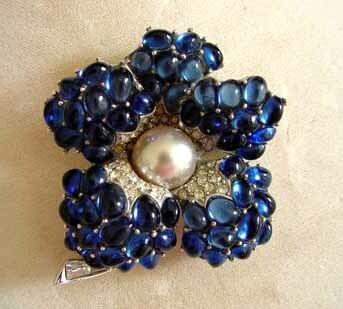 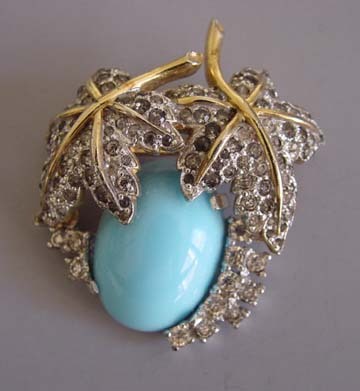 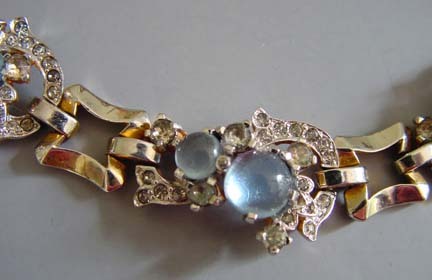 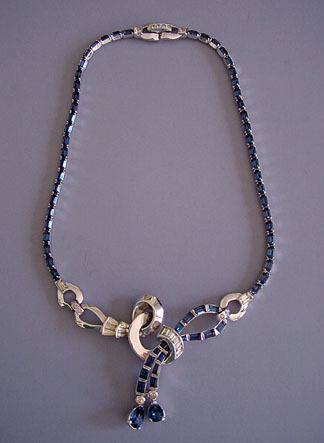 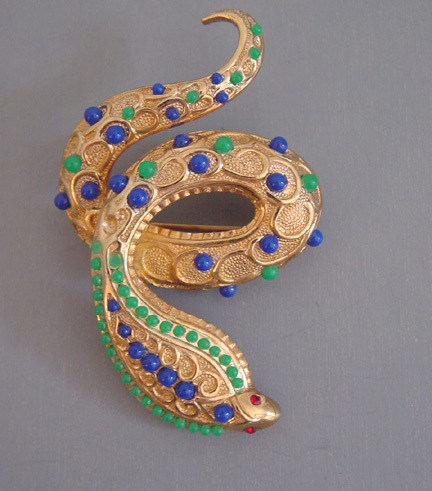 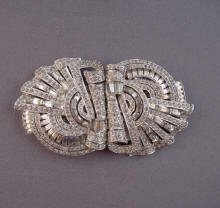 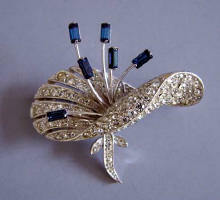 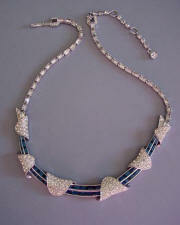 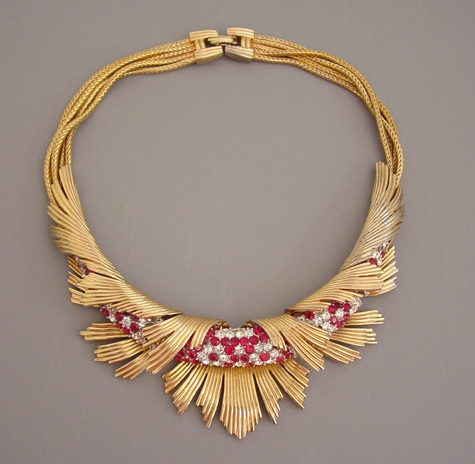 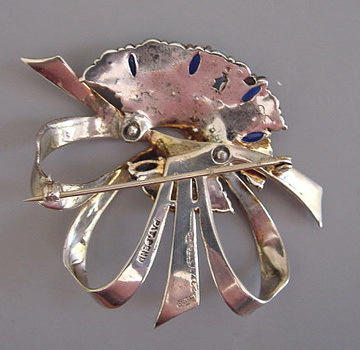 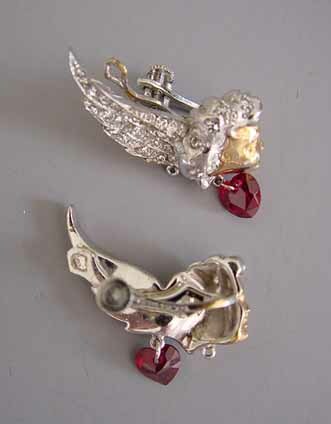 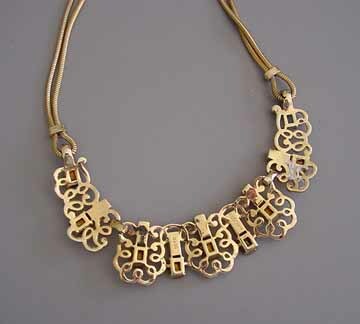 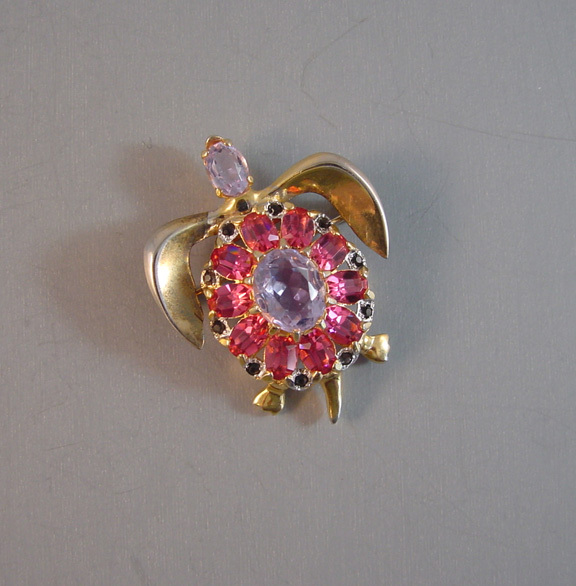 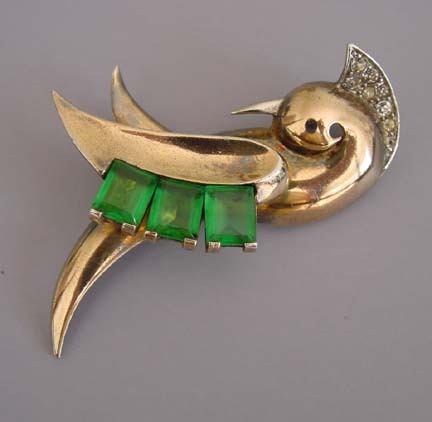 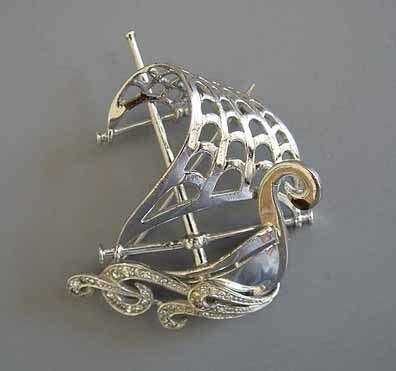 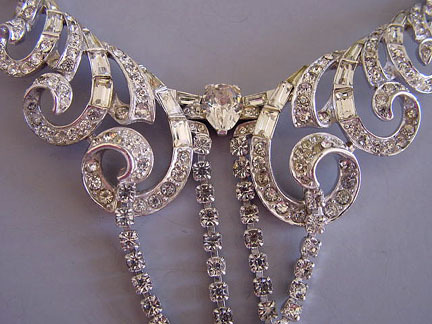 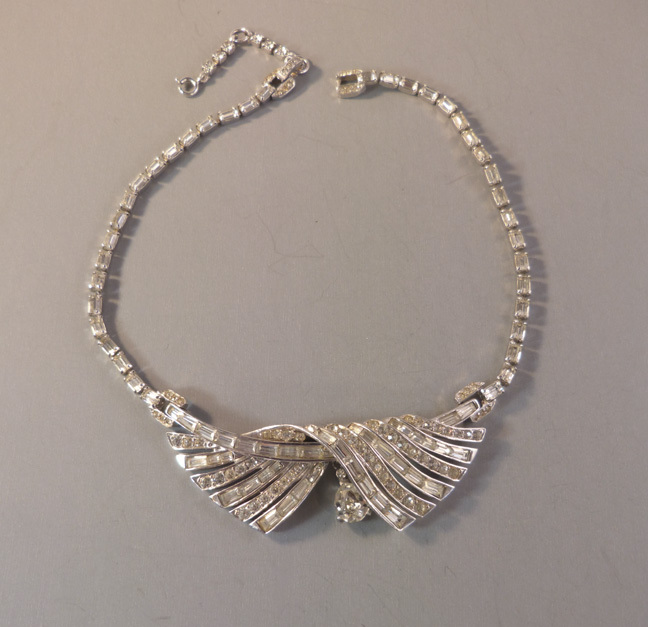 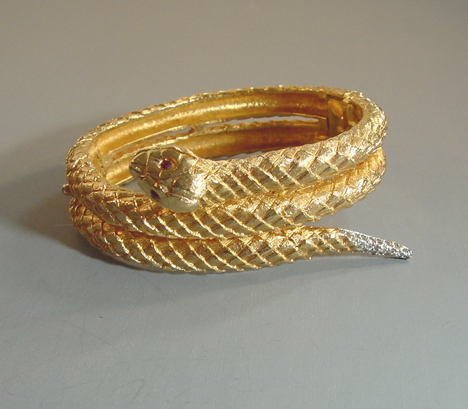 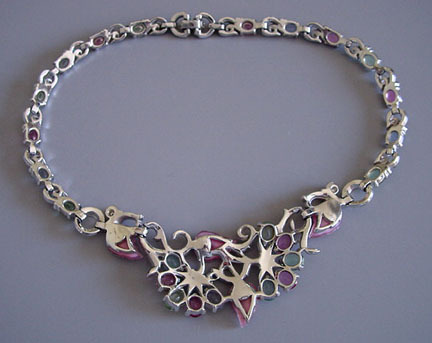 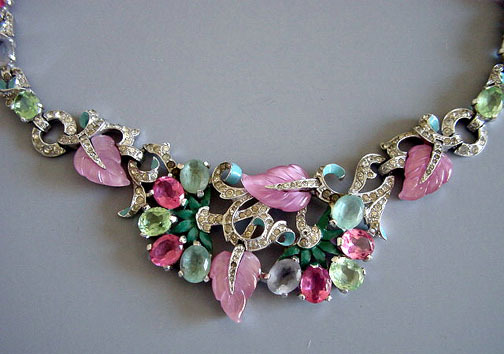 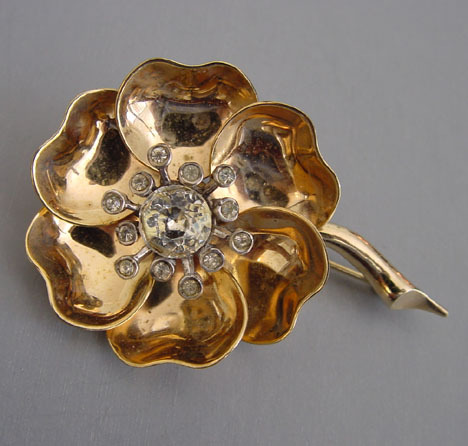 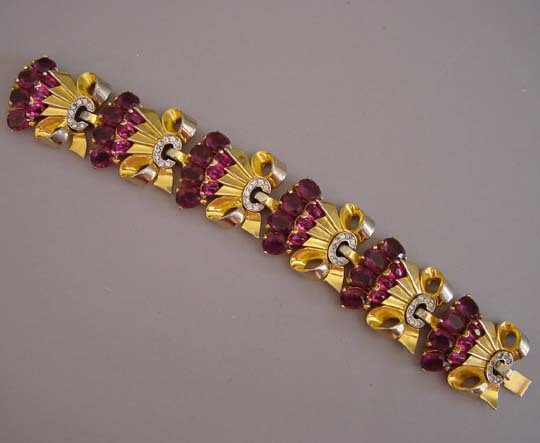 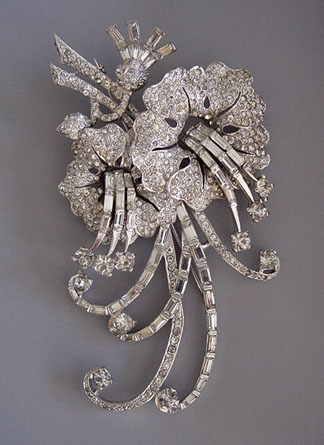 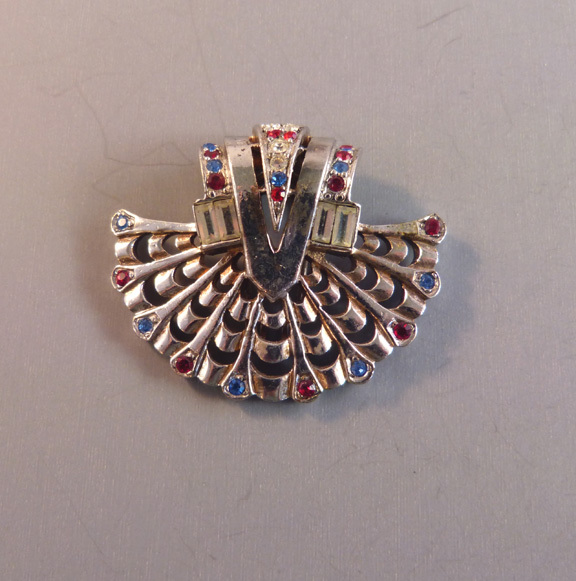 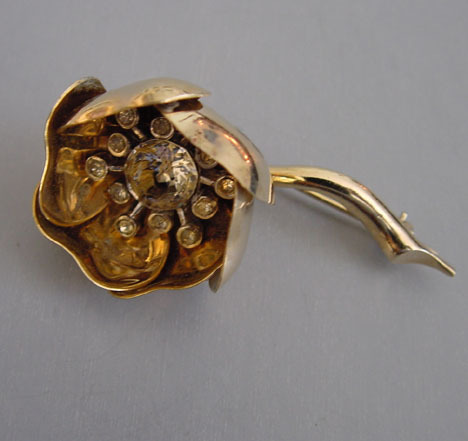 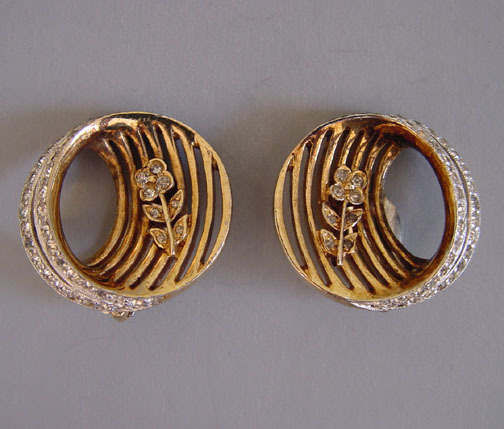 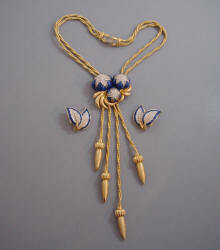 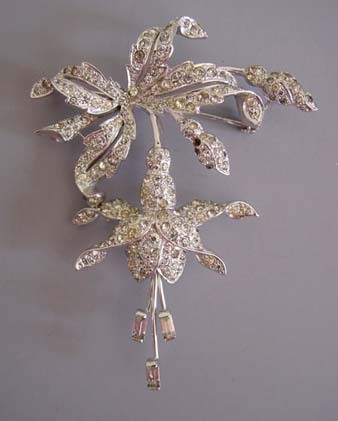 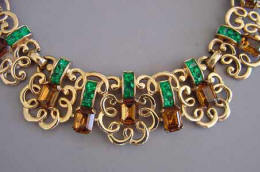 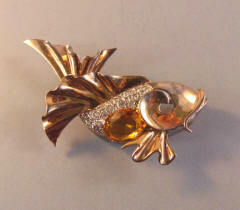 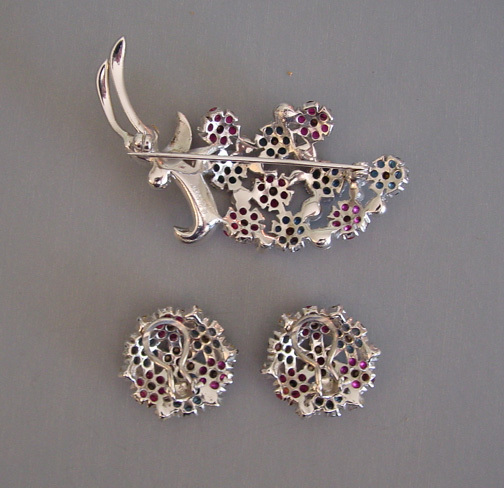 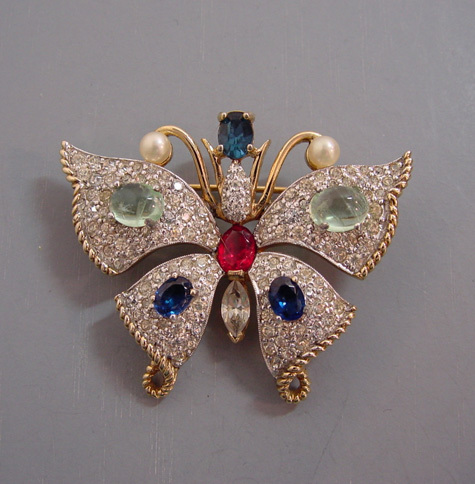 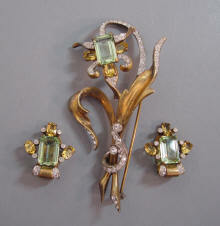 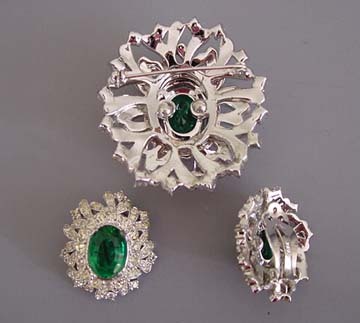 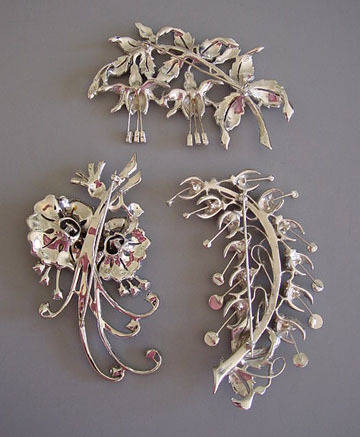 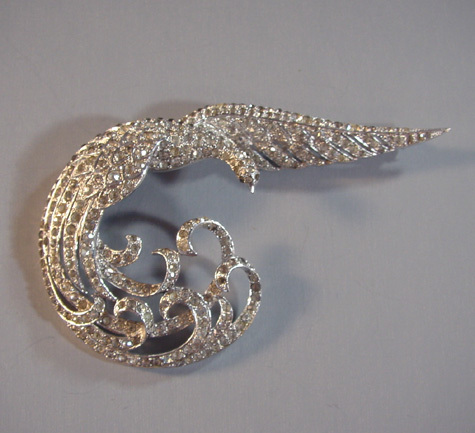 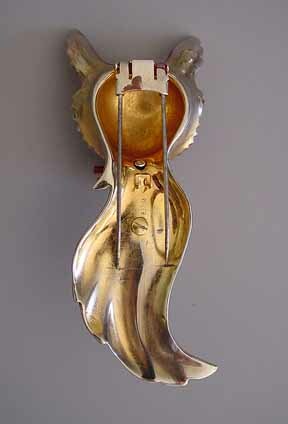 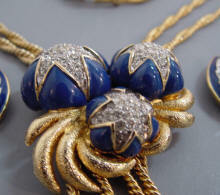 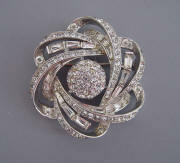 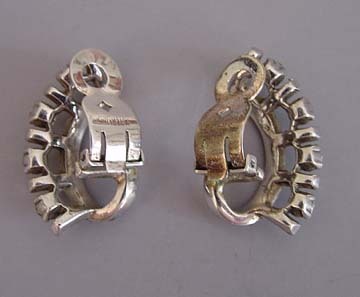 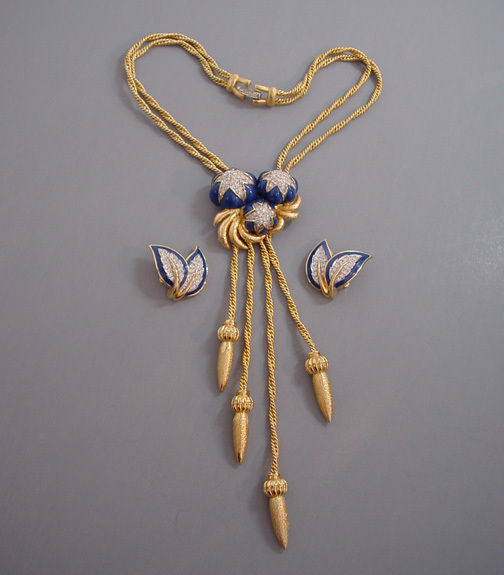 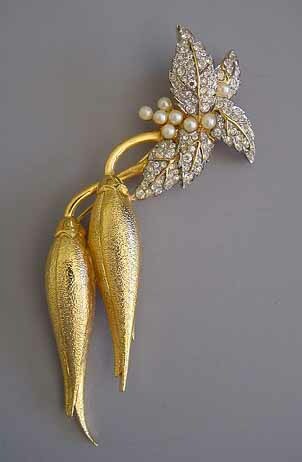 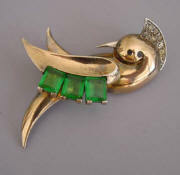 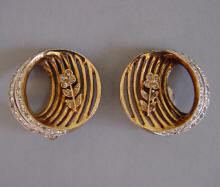 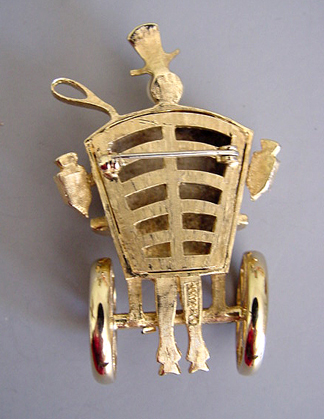 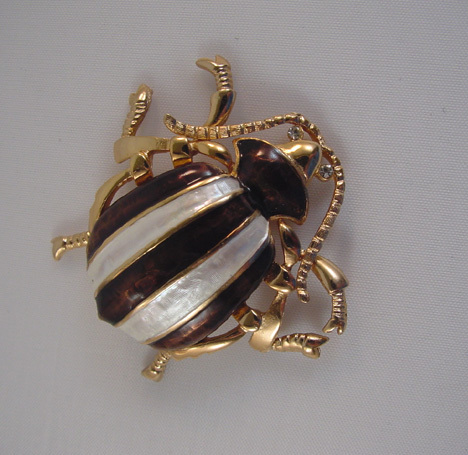 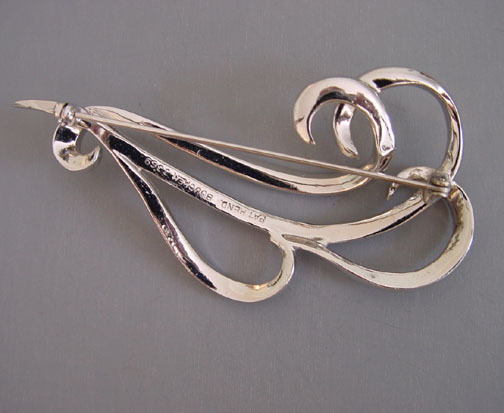 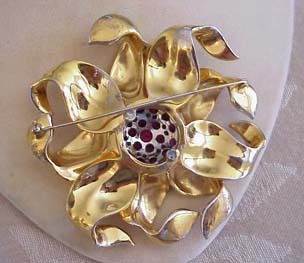 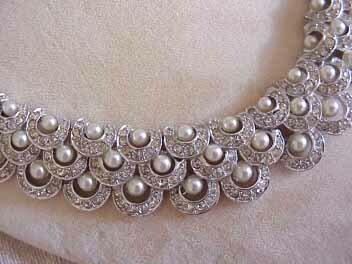 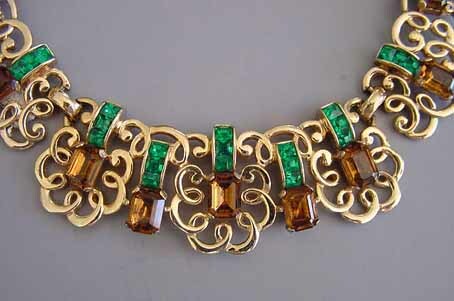 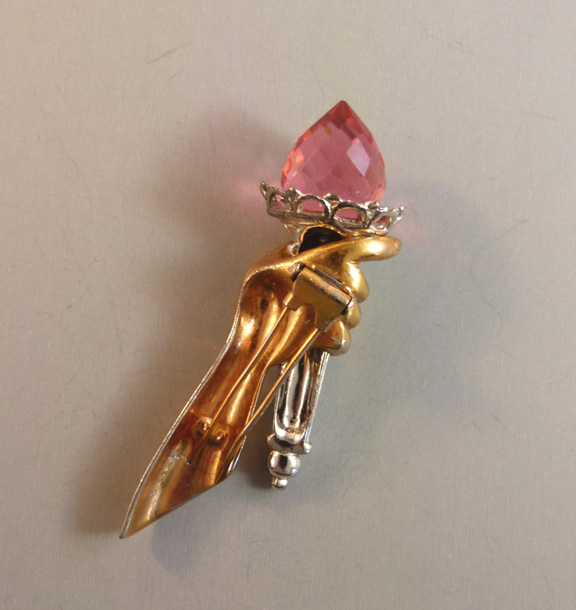 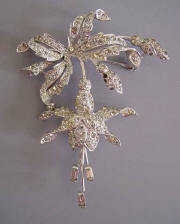 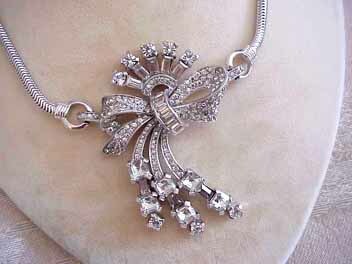 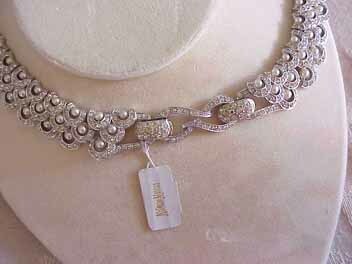 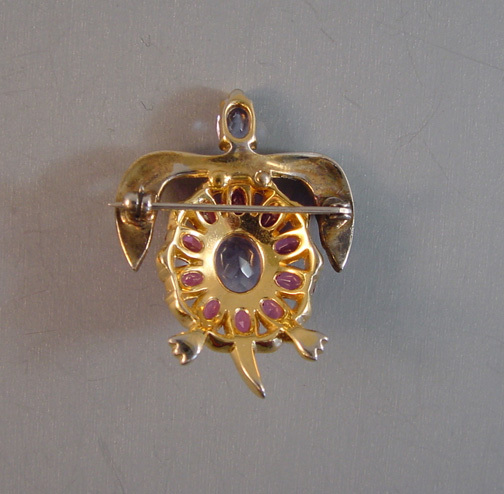 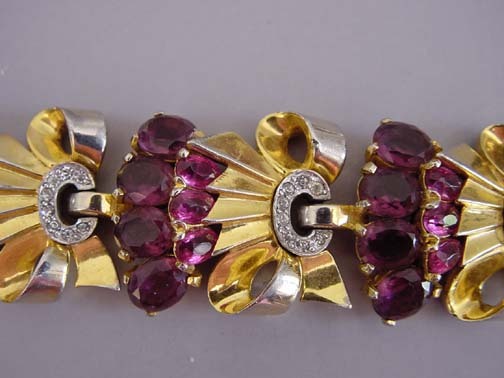 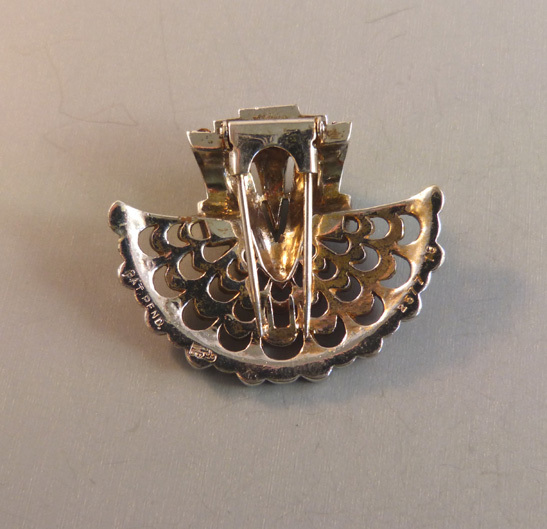 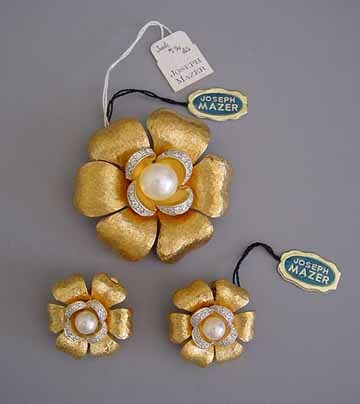 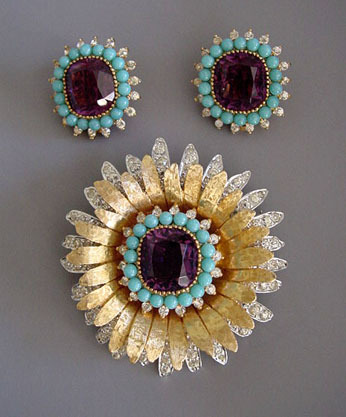 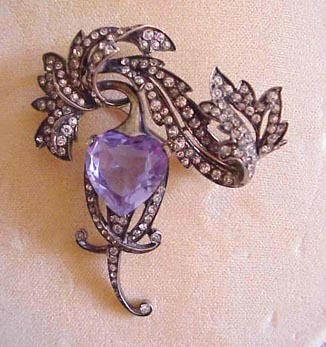 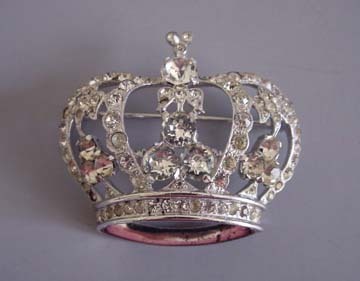 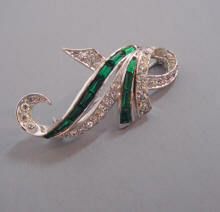 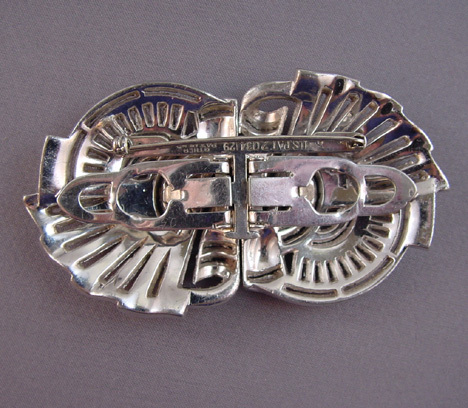 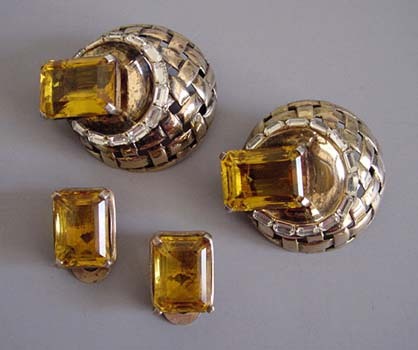 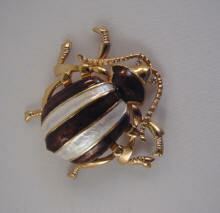 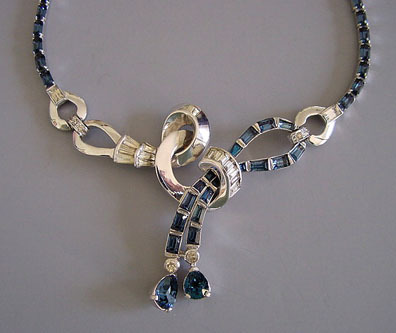 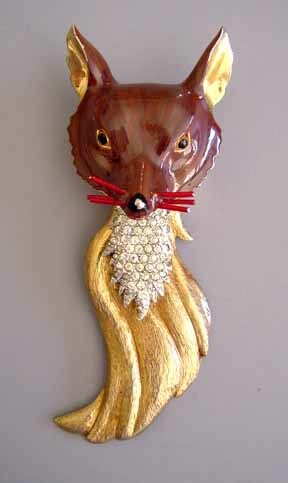 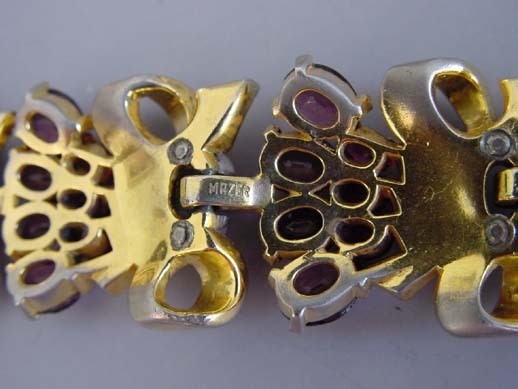 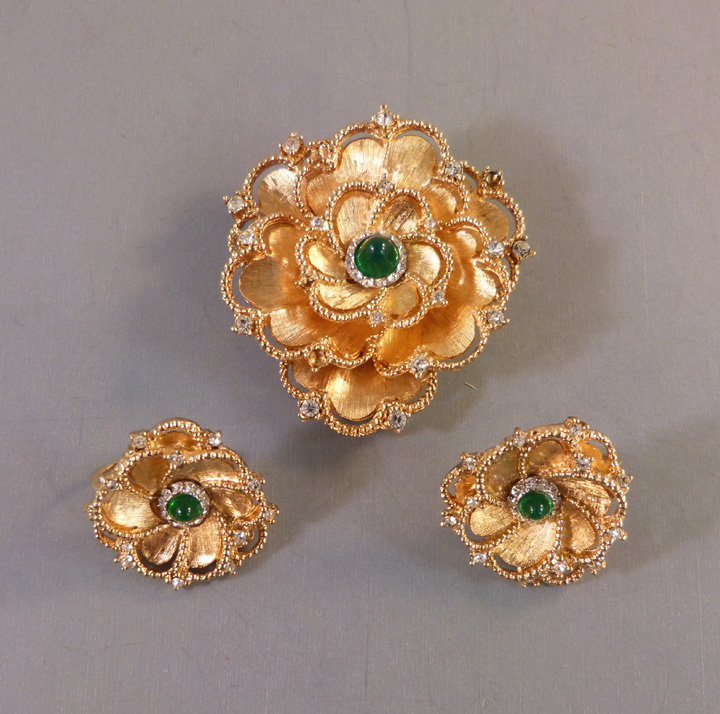 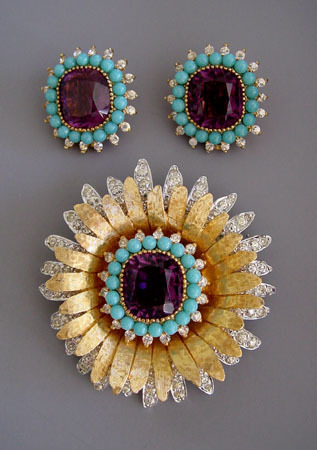 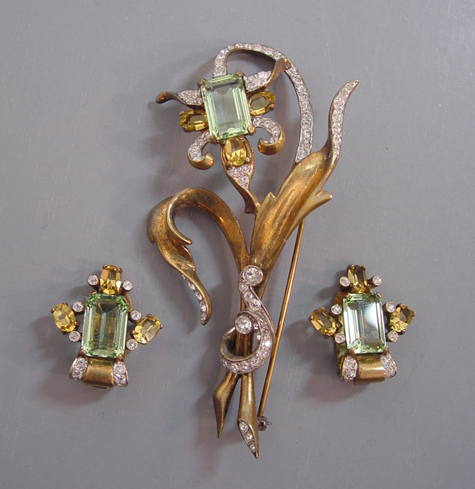 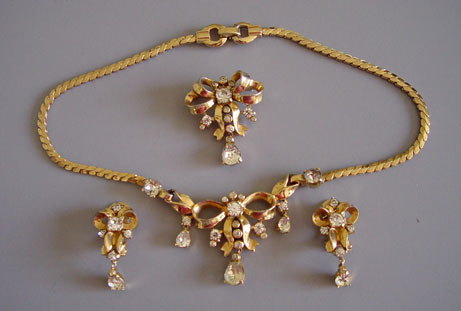 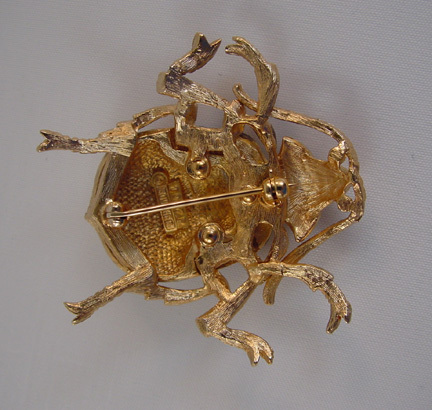 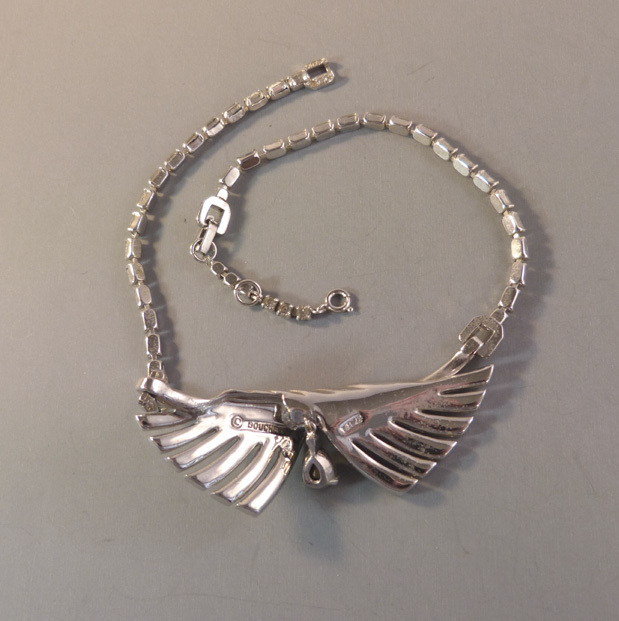 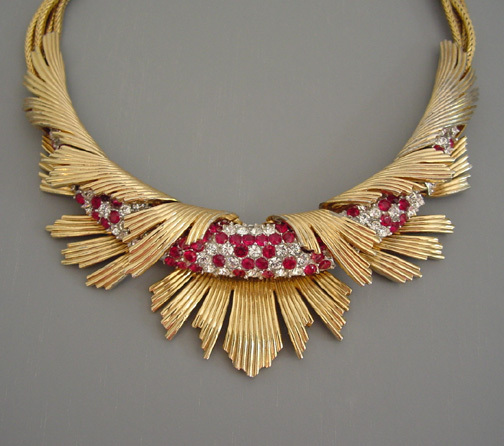 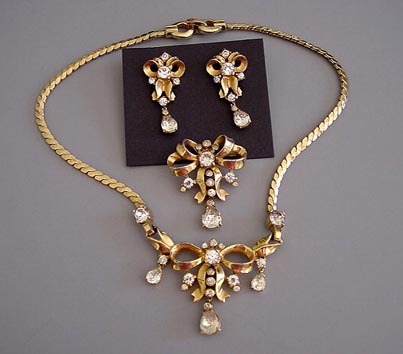 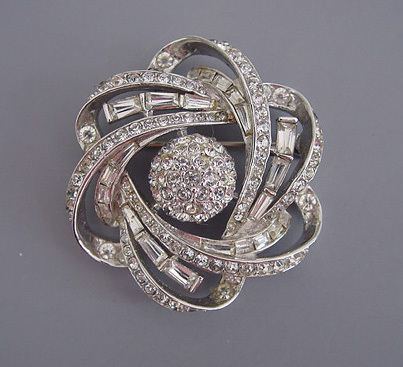 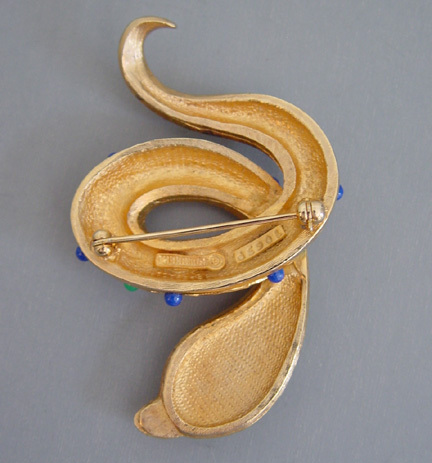 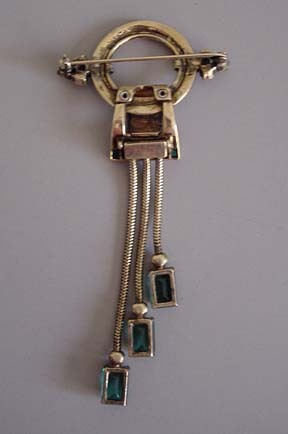 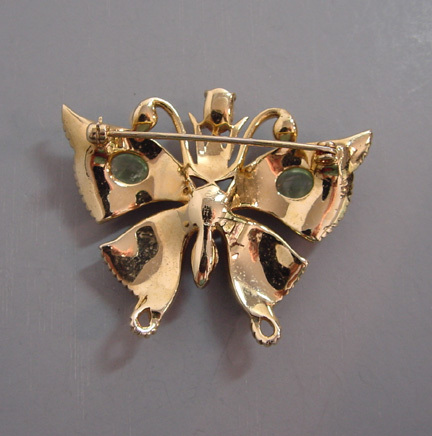 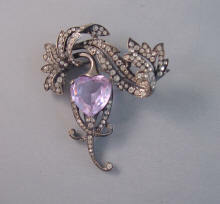 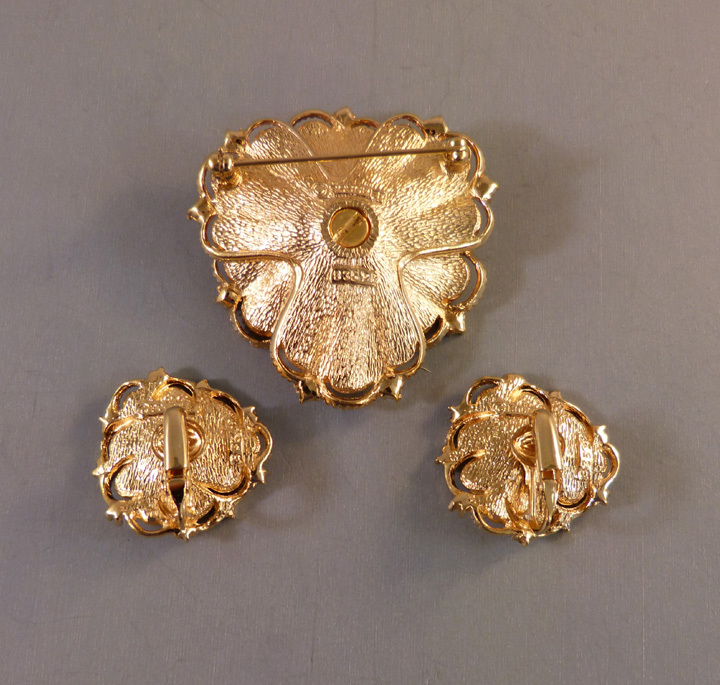 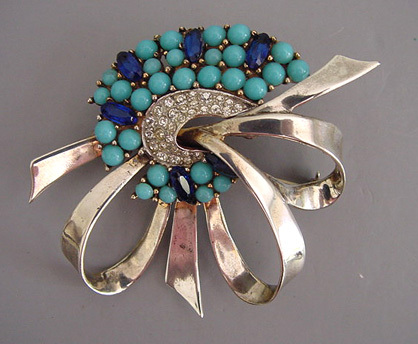 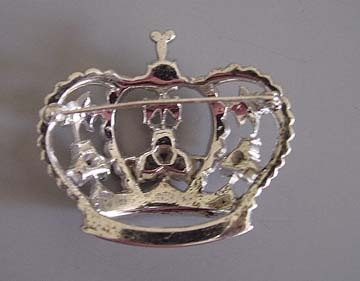 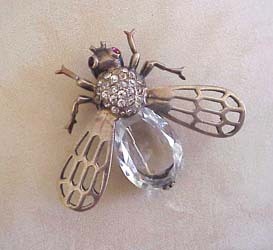 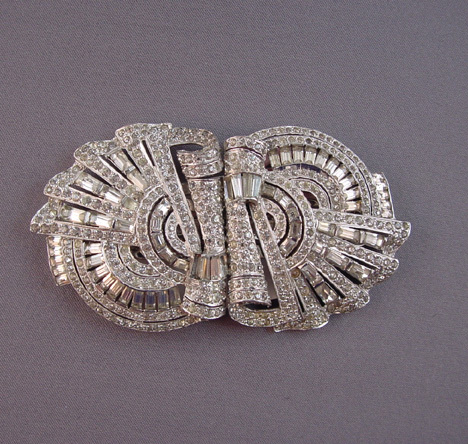 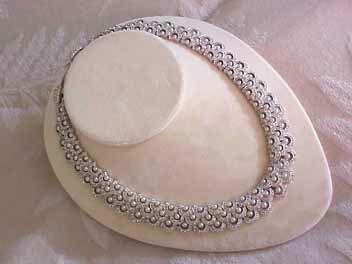 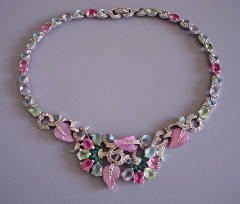 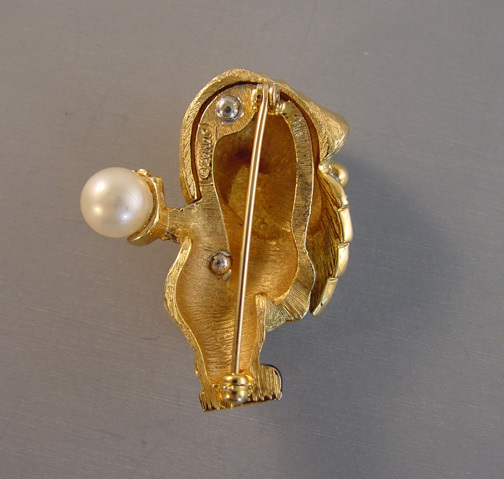 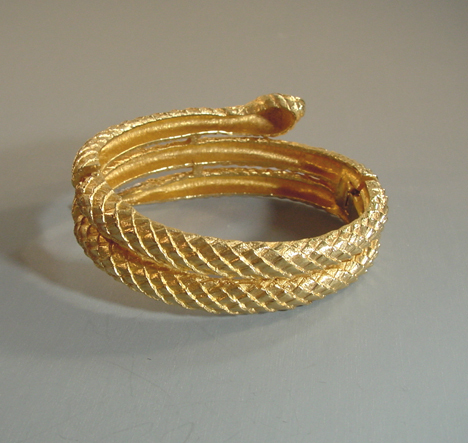 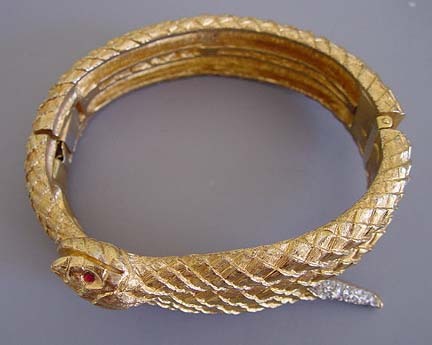 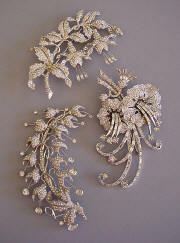 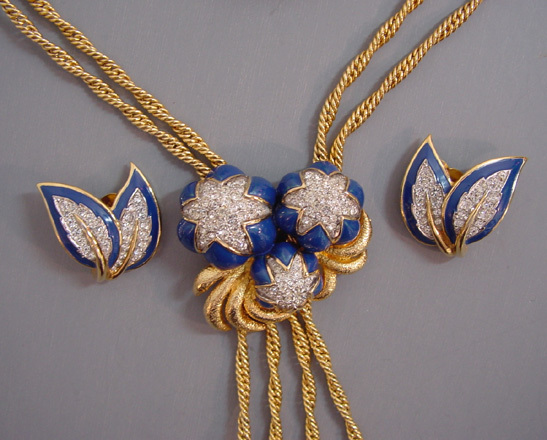 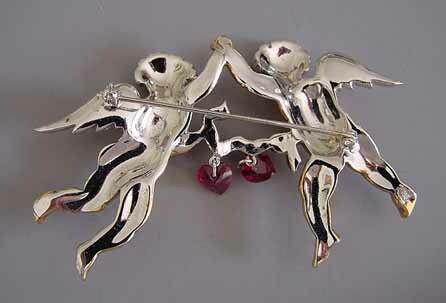 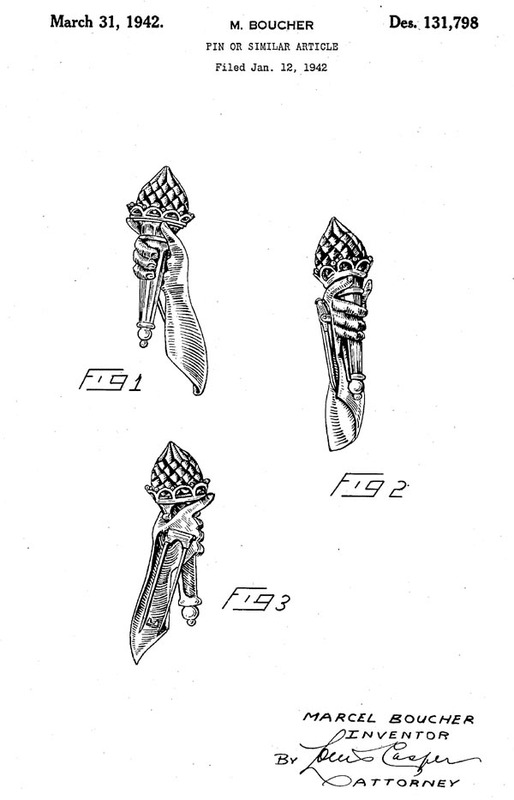 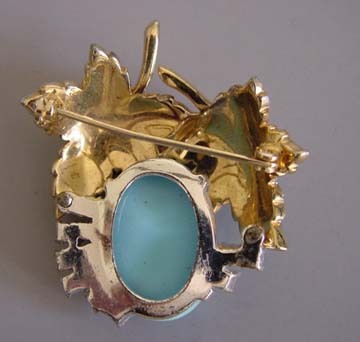 Marcel Boucher was one of costume jewelry's most respected designers. 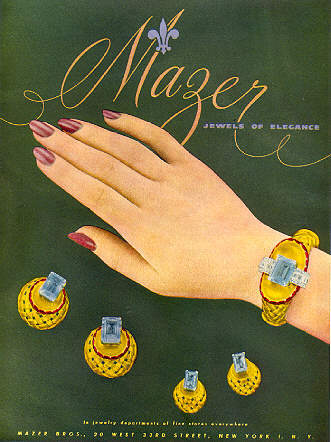 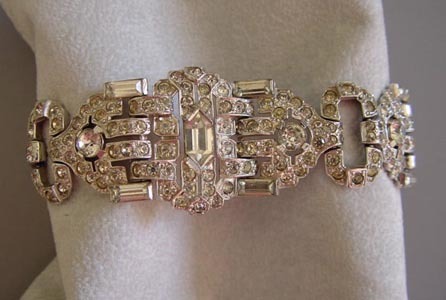 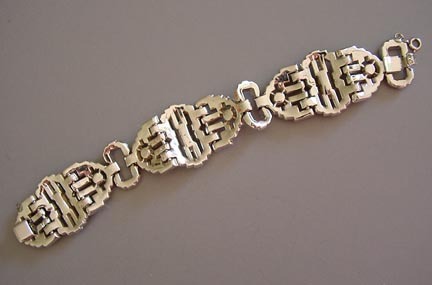 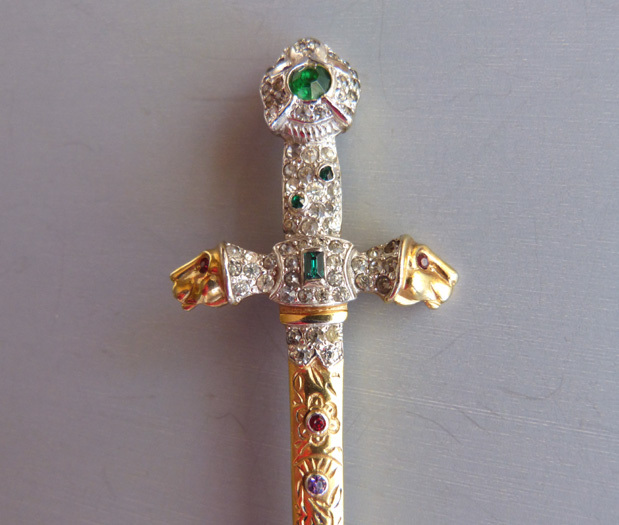 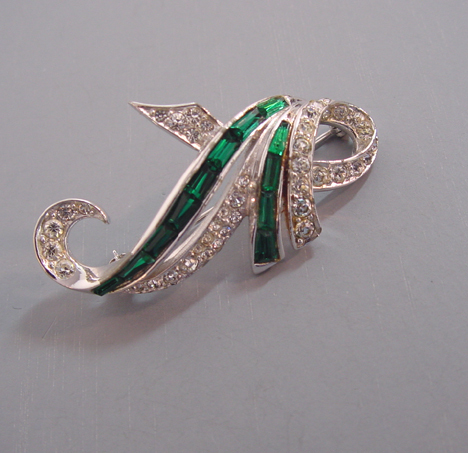 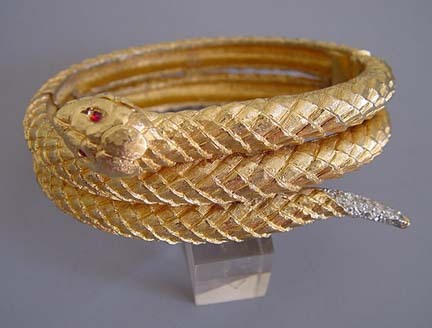 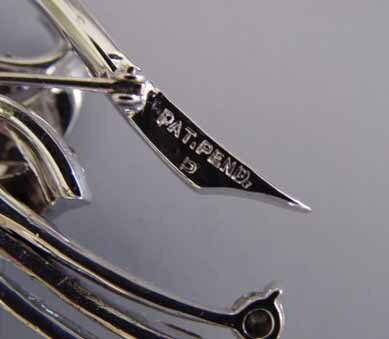 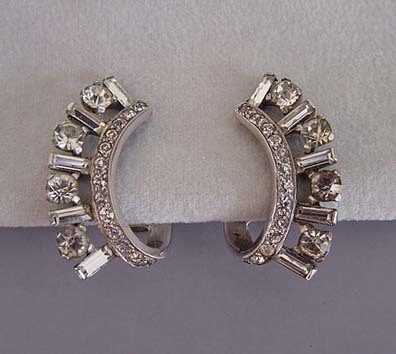 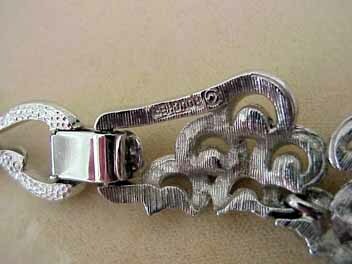 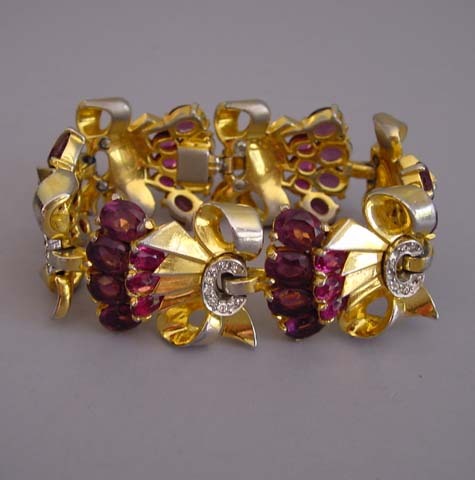 He began by designing fine jewelry for Cartier in New York City then moved into creating his own line in about 1937. 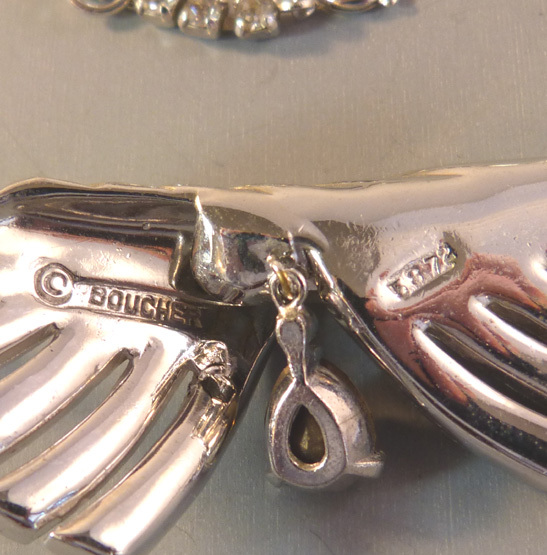 Making jewelry with the marks "MB", "Boucher" and "Marboux", his designs were fluid and detailed and his enamels have a colorful translucent quality that make them a particular favorite. 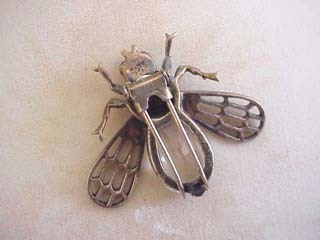 Shown together to indicate relative size. 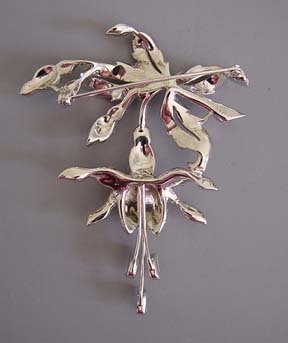 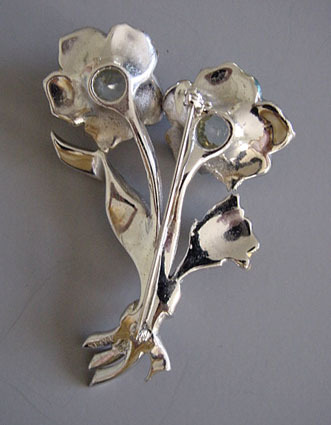 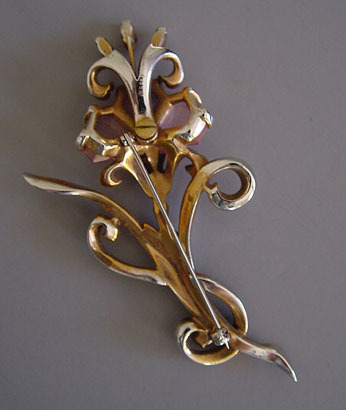 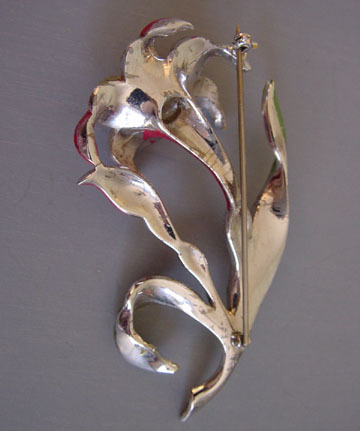 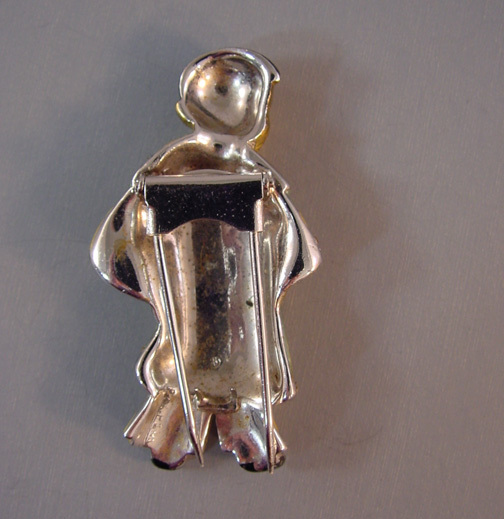 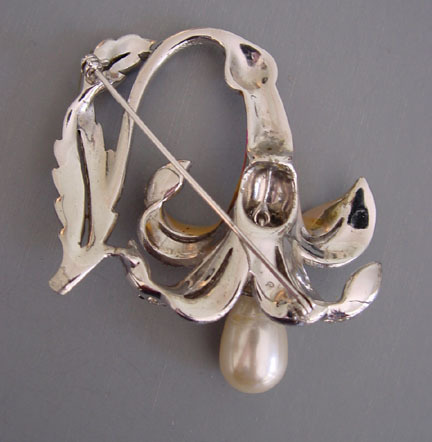 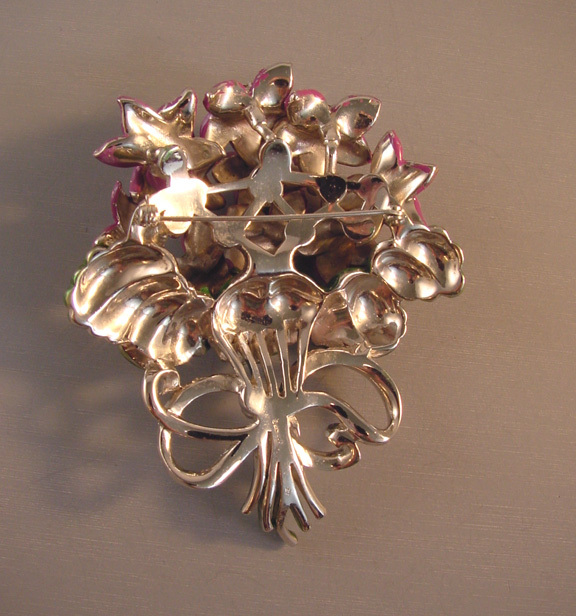 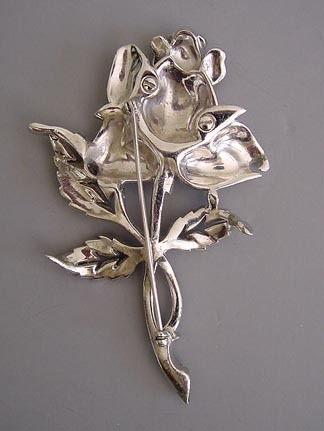 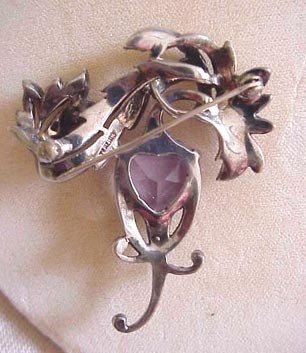 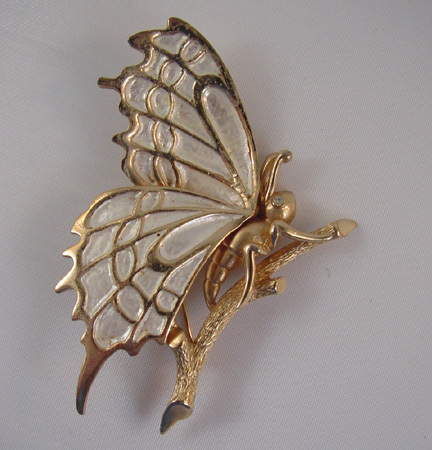 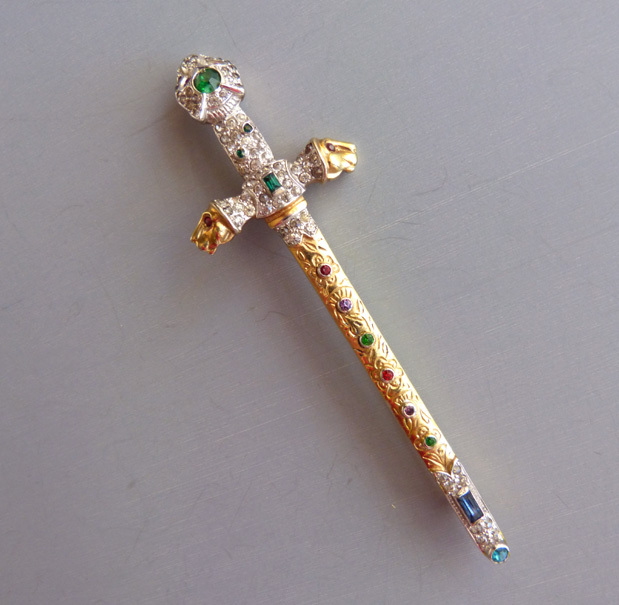 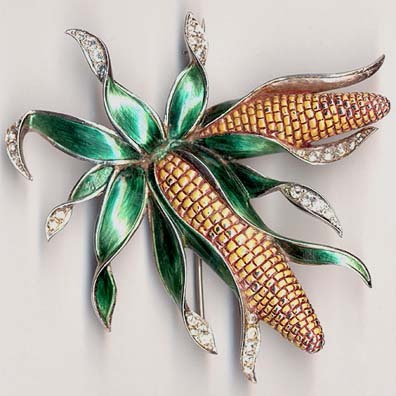 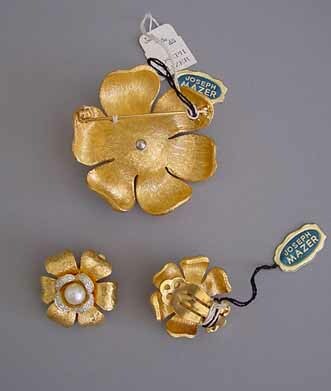 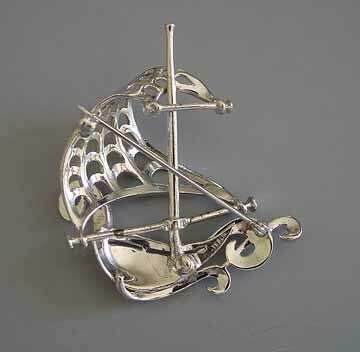 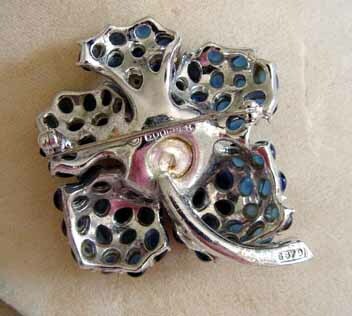 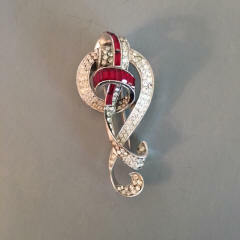 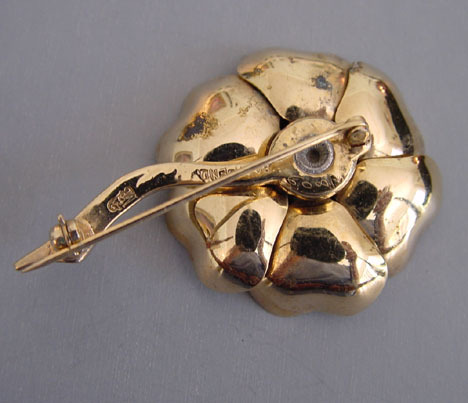 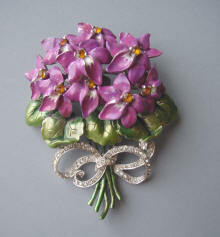 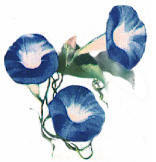 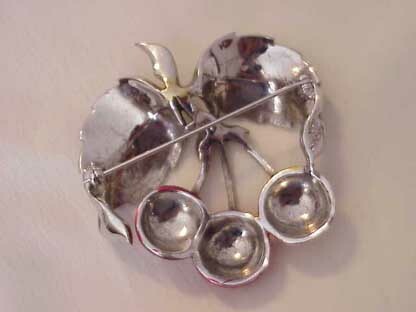 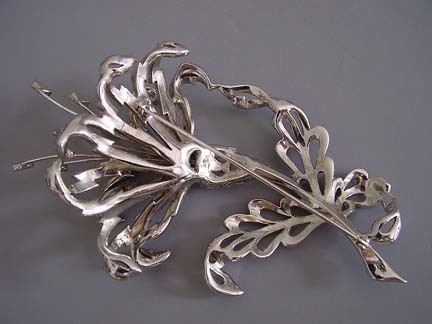 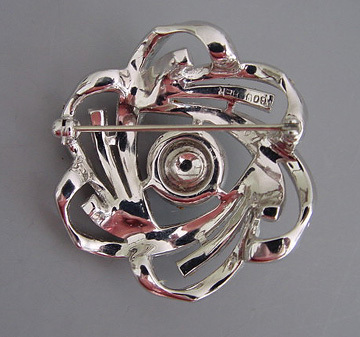 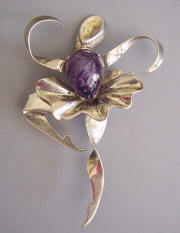 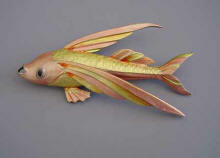 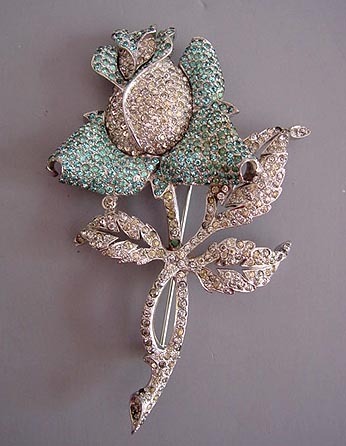 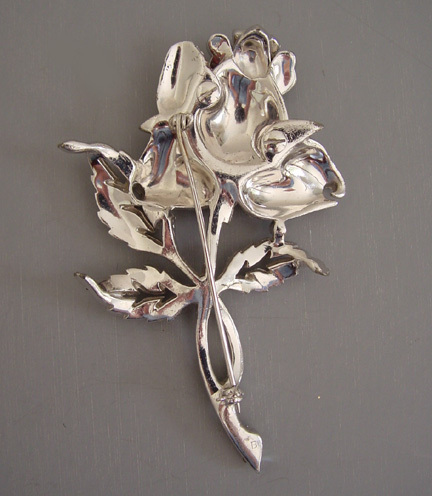 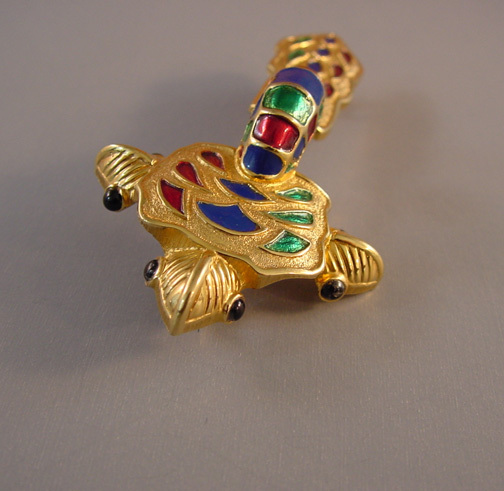 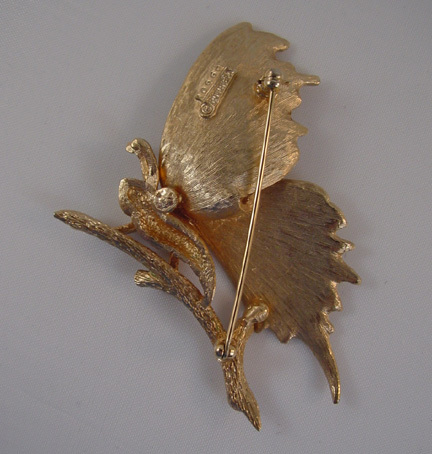 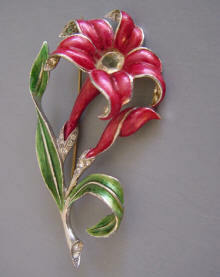 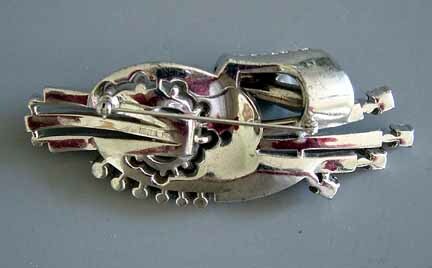 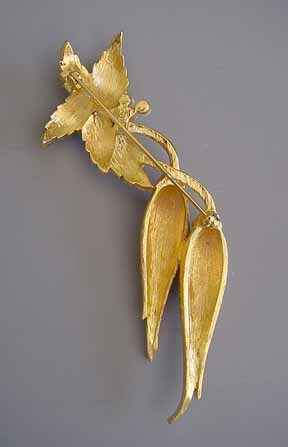 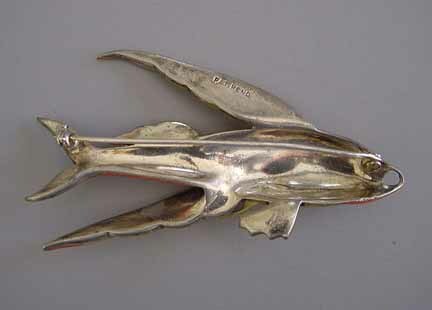 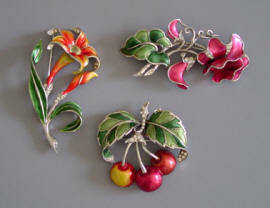 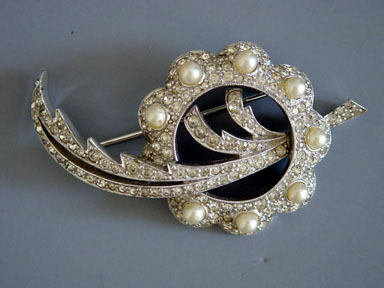 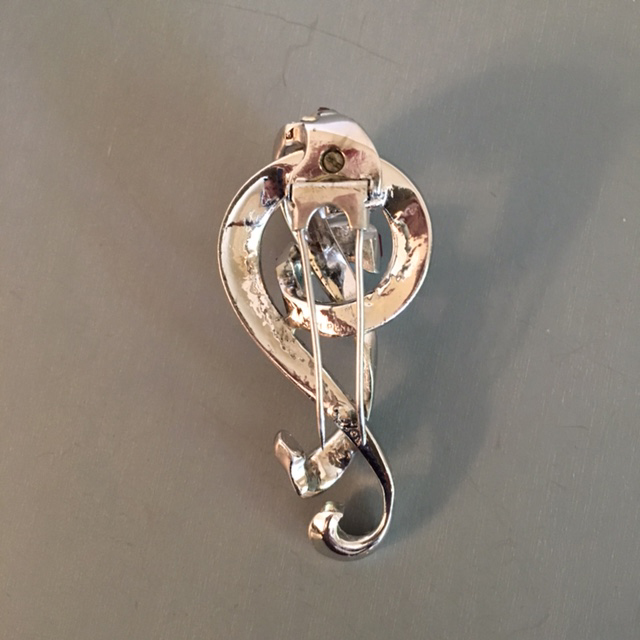 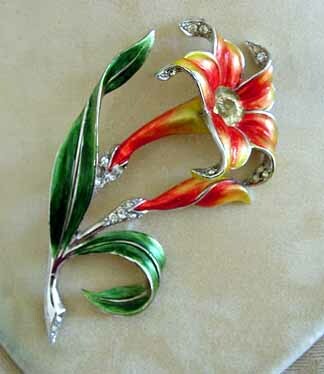 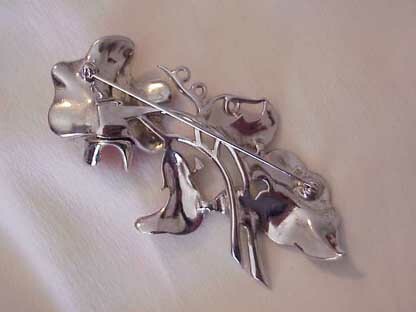 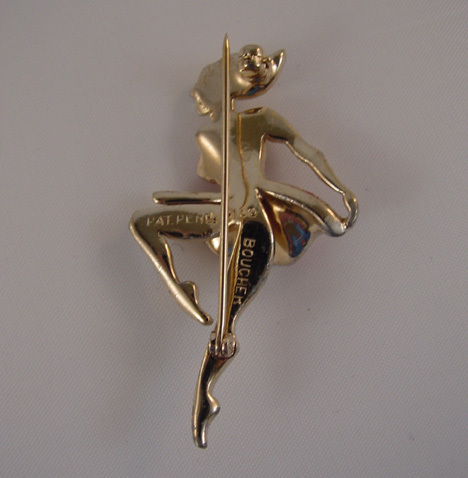 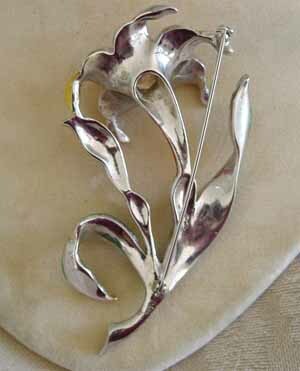 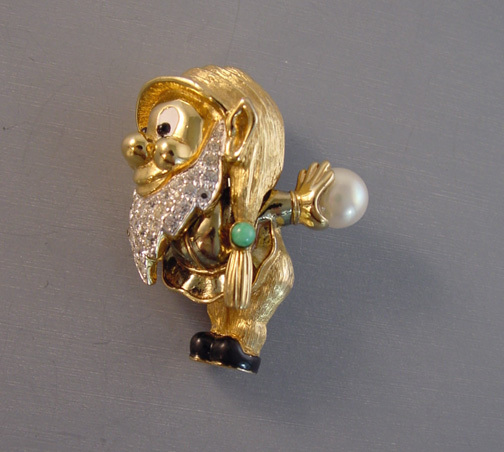 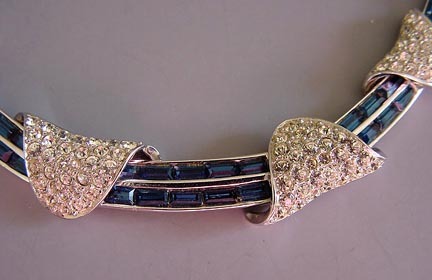 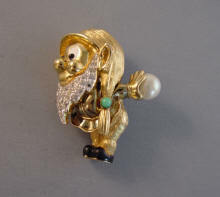 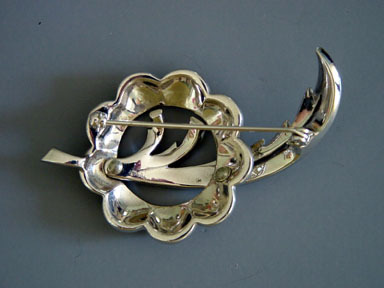 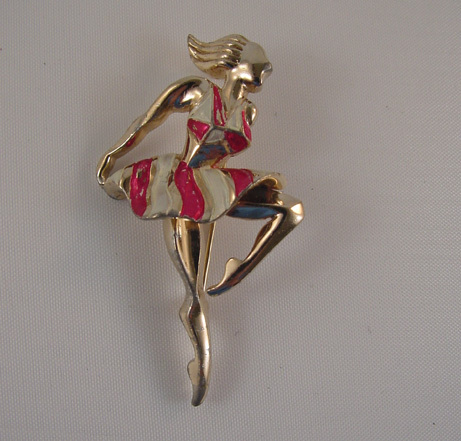 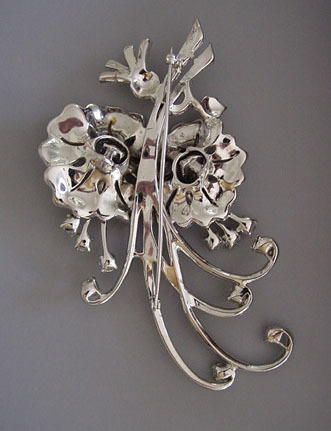 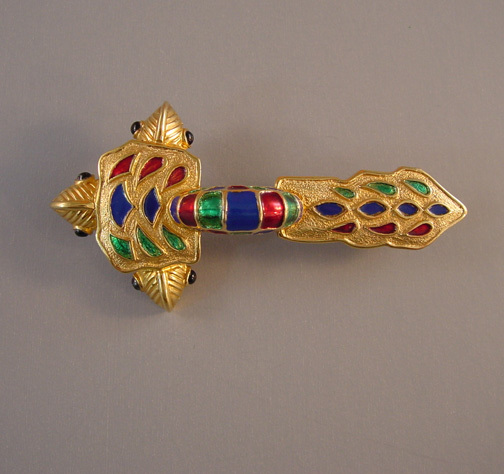 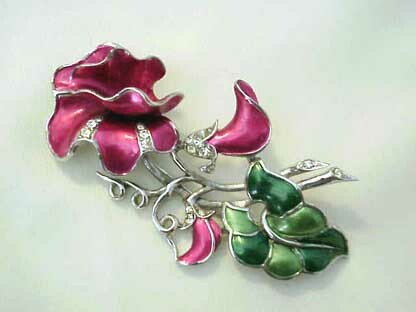 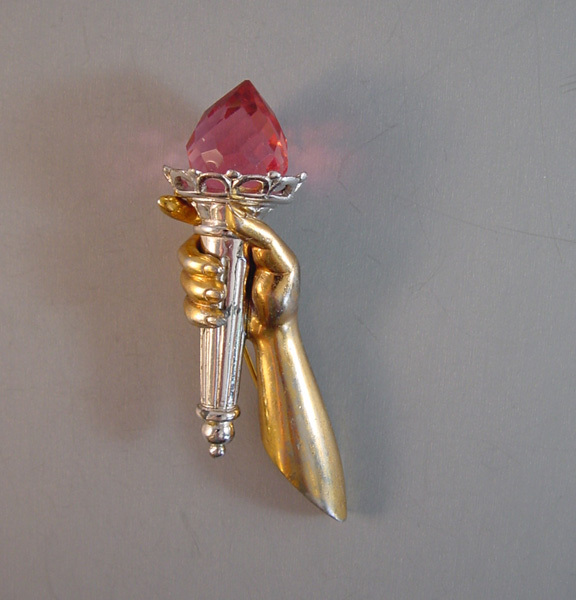 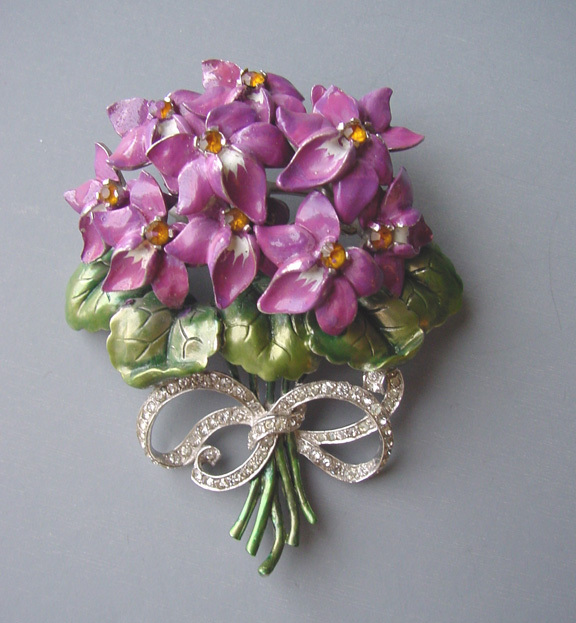 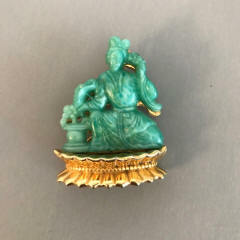 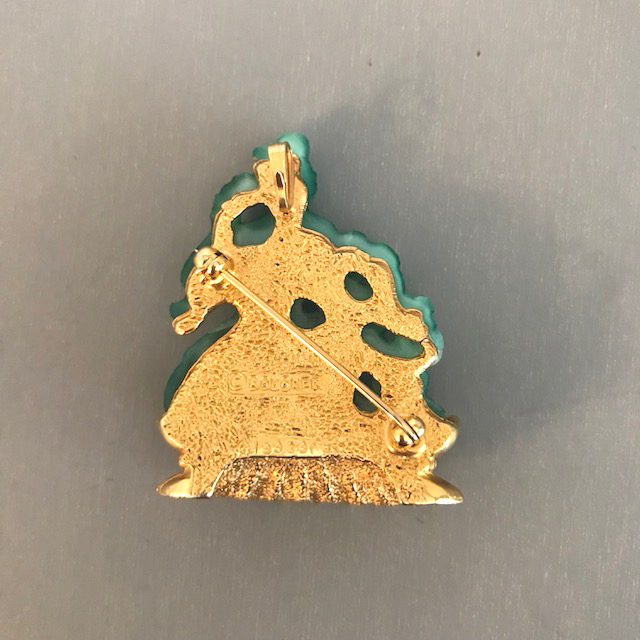 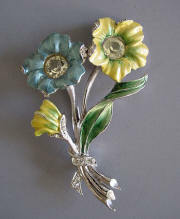 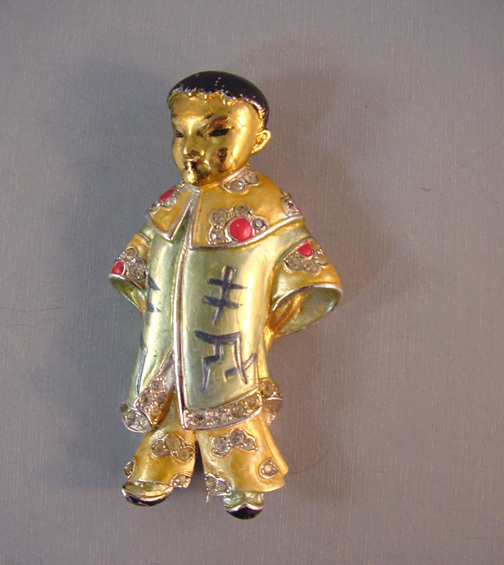 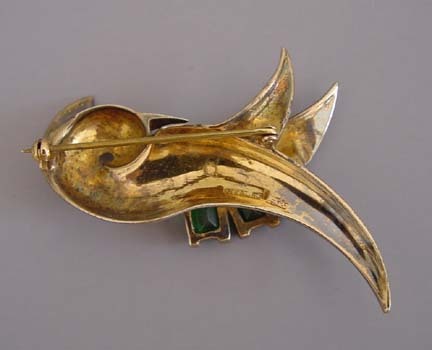 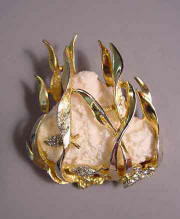 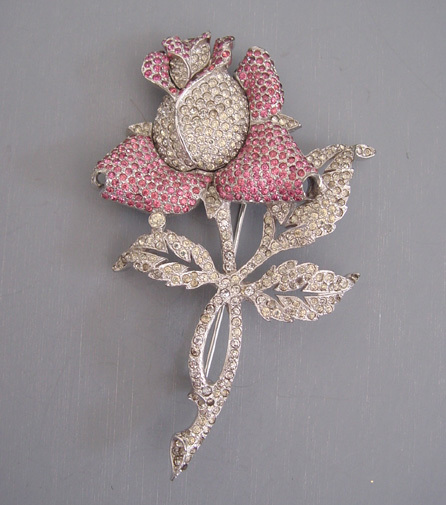 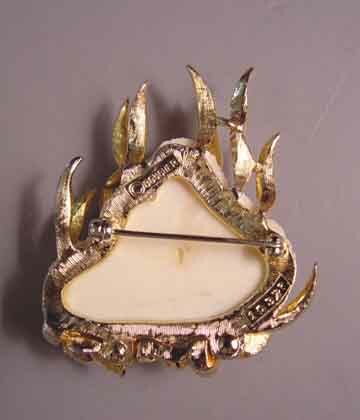 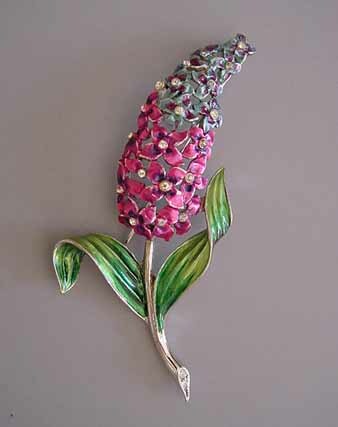 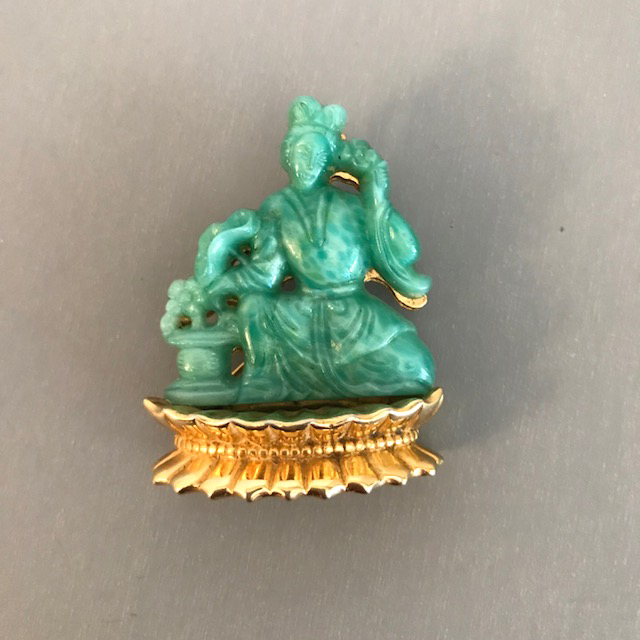 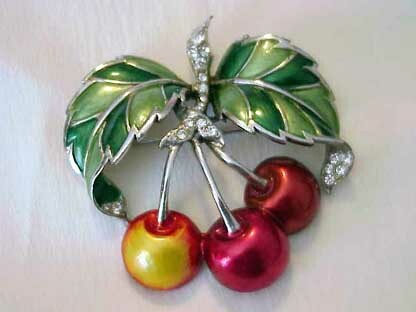 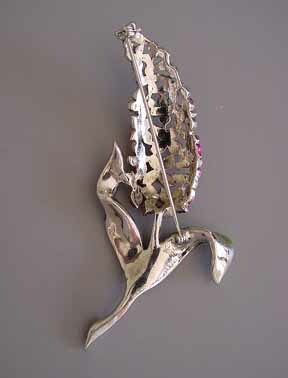 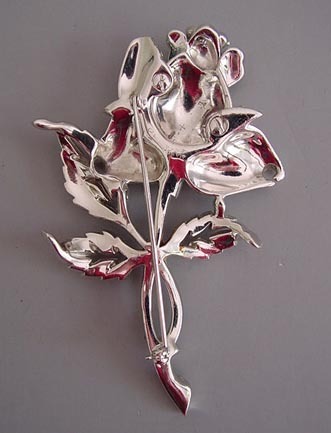 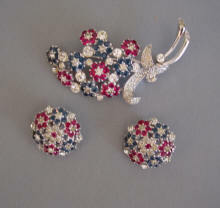 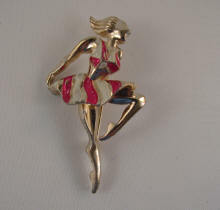 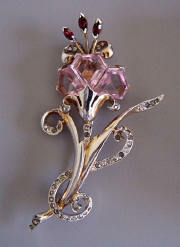 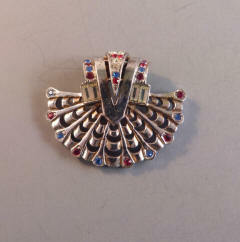 MB ENAMEL sweet pea brooch, circa 1940. 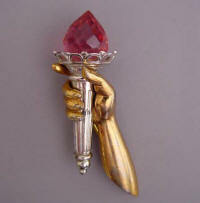 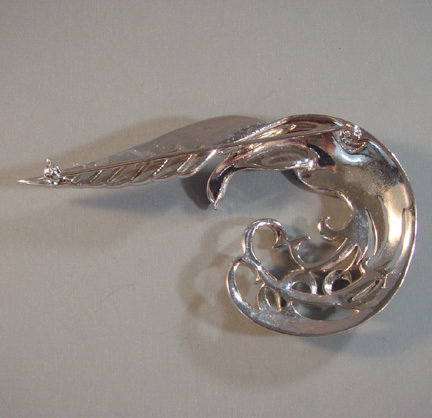 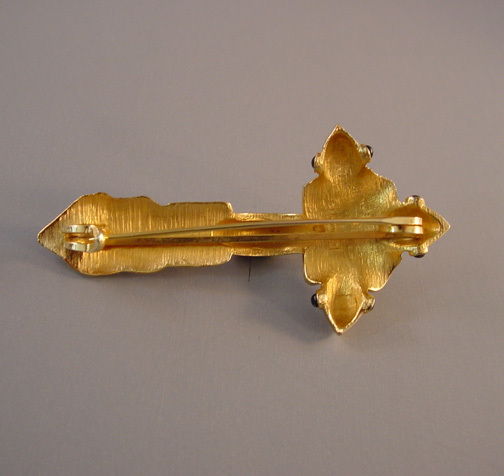 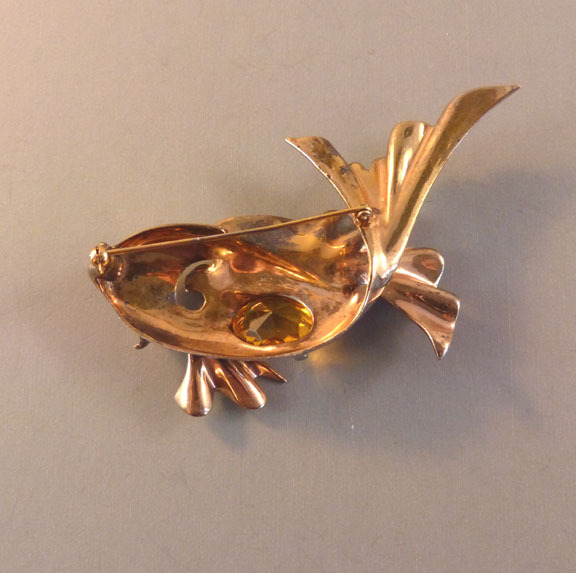 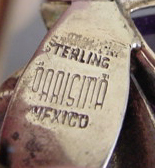 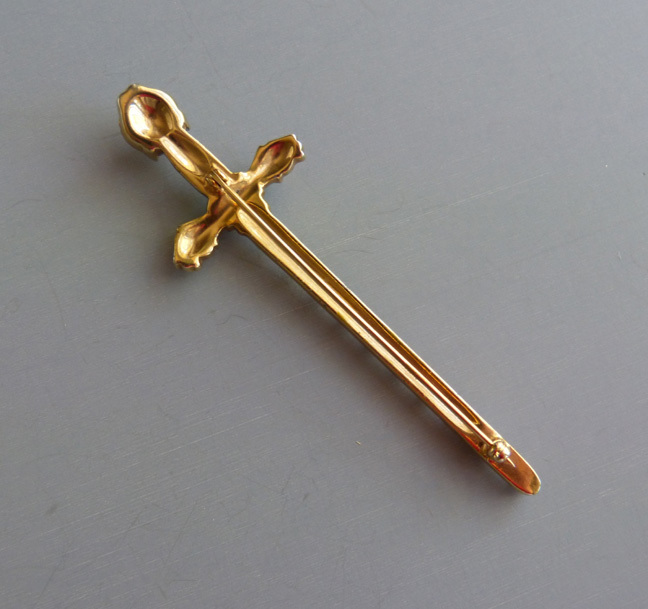 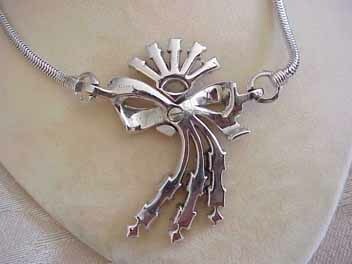 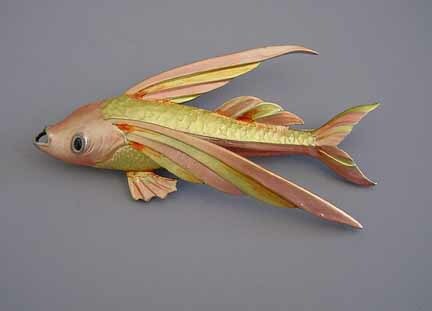 This is the same piece seen in Christie Romero's "Warman's Jewelry", 3rd Ed, page 193. 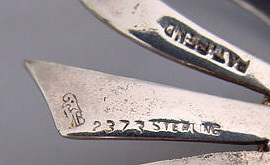 View #B16699. 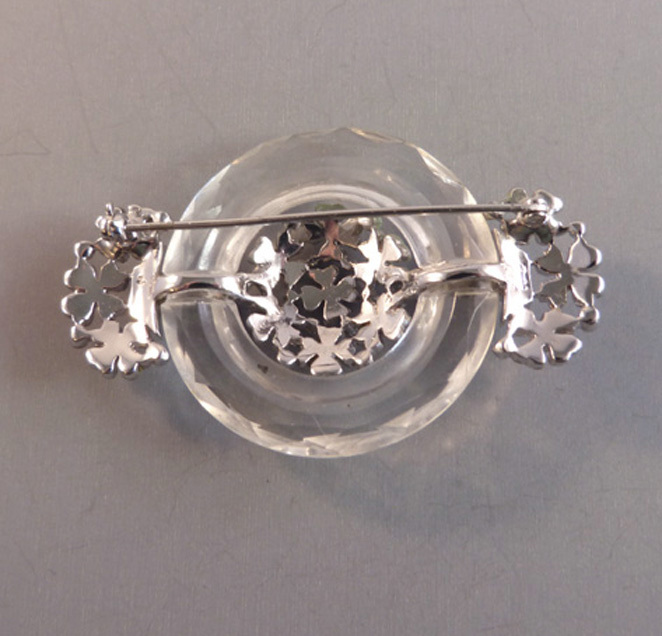 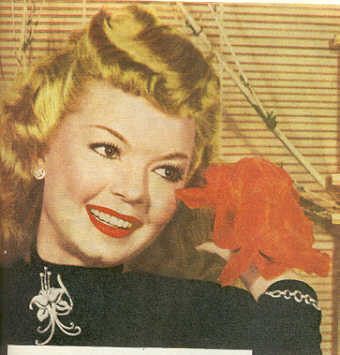 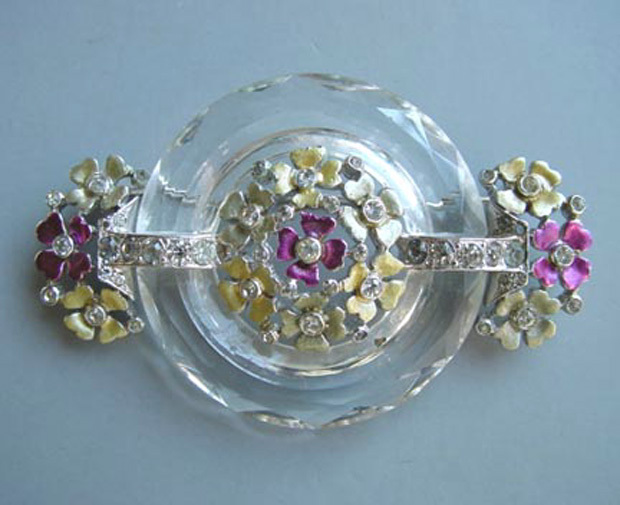 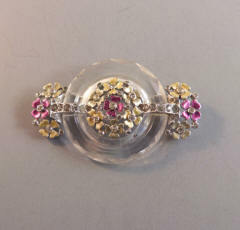 She wears a Boucher clear rhinestones flower brooch.